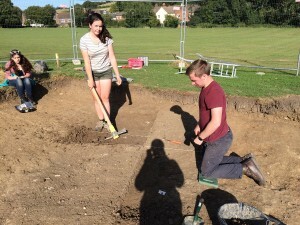 Lyminge Archaeology | This is the blog of the Lyminge Archaeological Project. We are delighted to announce the latest publication from the Lyminge Project based upon the proceedings of international conference held at the University of Kent in April 2015 at which several Lyminge residents were present. 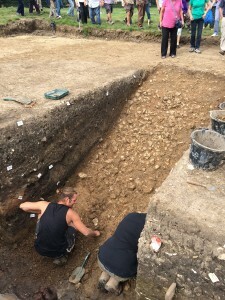 The conference brought together leading historians and archaeologists to reflect upon the results of the Lyminge excavations framed within the context of the expansion of monasticism across the early medieval North Sea region. The latest discoveries from Lyminge and their wider importance obviously take centre stage (enhanced by an extensive selection of colour illustrations, including wonderful shots of the Anglo-Saxon glass taken by John Piddock! ), but the volume will appeal to anyone with an interest in the history of monasticism in Anglo-Saxon Kent and the archaeology of early medieval monasticism more generally. Those wishing to purchase their own copy can do so through Oxbow Books. It seems like it was only a little while ago that we were unearthing the flints and finds in the bottom of our ‘blob’, but the months have in reality flown past. It might seem like the project has been hibernating, and certainly the blog has been rather quiet in the months following the completion of our final excavation in summer 2015, but we wanted to reassure you that there is still plenty of work going on behind the scenes. The project Director, Gabor Thomas, is currently fully absorbed in completing funding applications for the large and complex programme of post-excavation analysis required to bring the excavations to publication. As promised, we will keep you posted on progress on the results of these applications over the coming months. 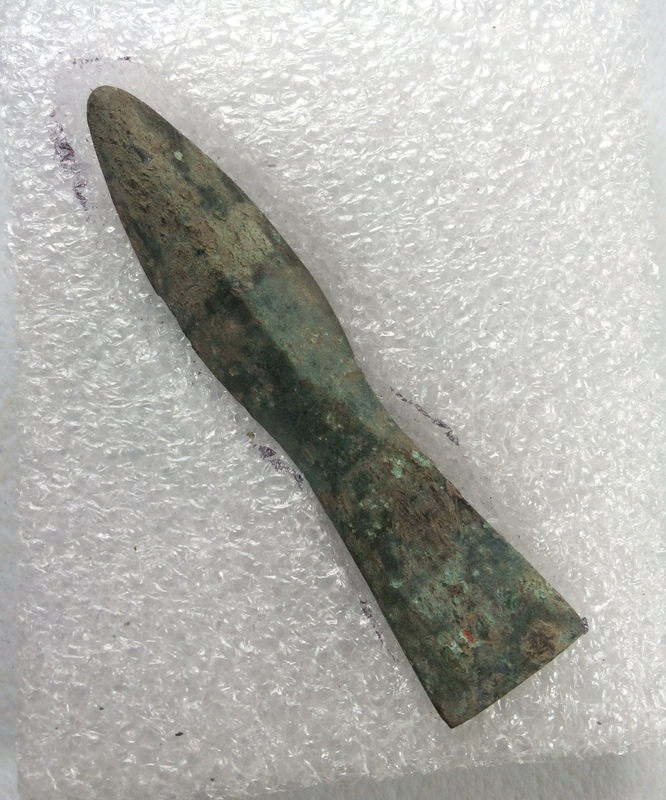 We are pleased to report that some of the star finds made in last summer’s excavation have been conserved by Dana Goodburn-Brown and we wanted to share the fantastic results with you. Remember these lovely finds as they came up? 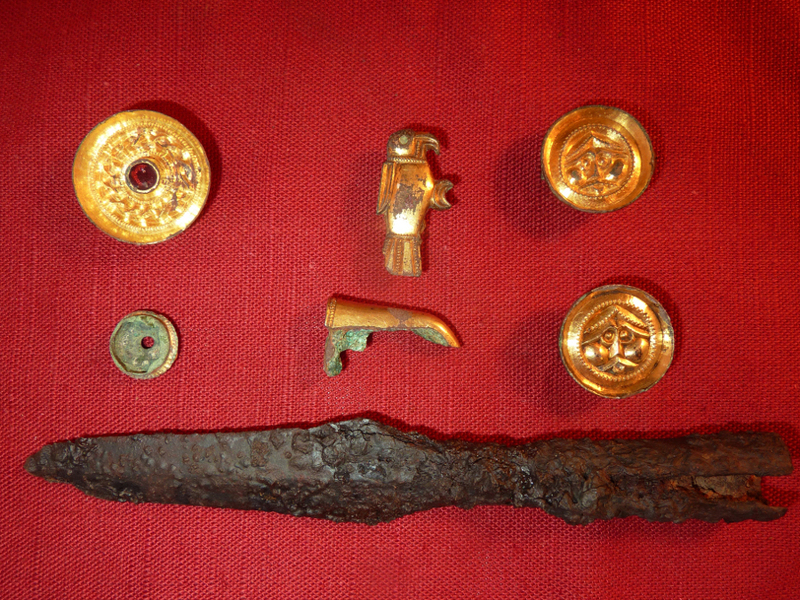 Here you can see a selection of gilded Anglo-Saxon brooches – a garnet-inlaid disc brooch (top left), a pair of button brooches (top and centre right) and a Frankish bird brooch (top centre) – alongside the fragment of a buckle (centre), the collar (centre left) from a decorative setting, and, at the bottom, a lovely iron spearhead. 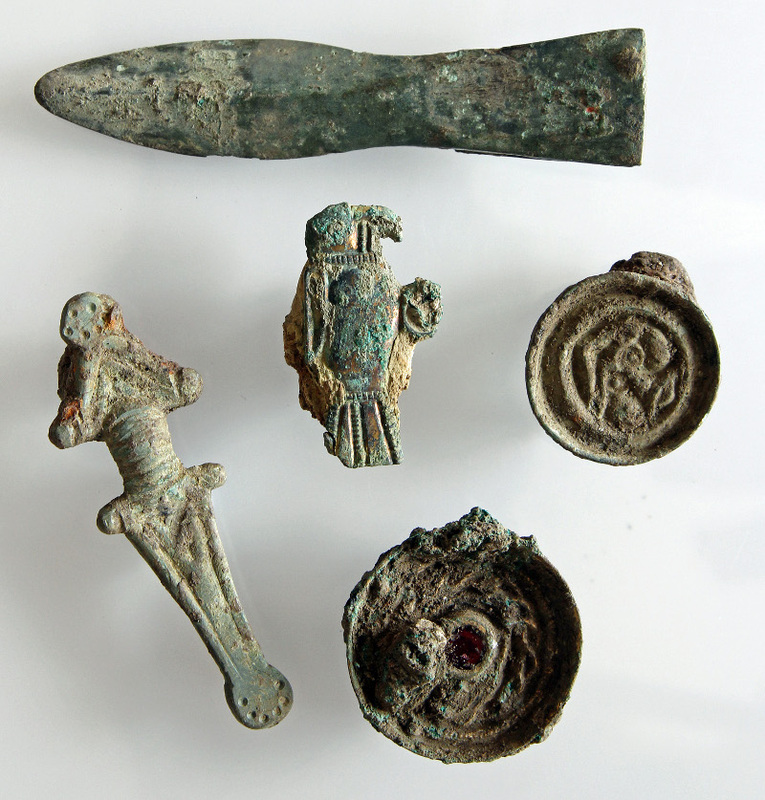 All of these objects were recovered from the midden deposits excavated from ‘The Blob’ and date to the sixth-century AD, contemporary with the use of the Anglo-Saxon cemetery located at the north of the village. 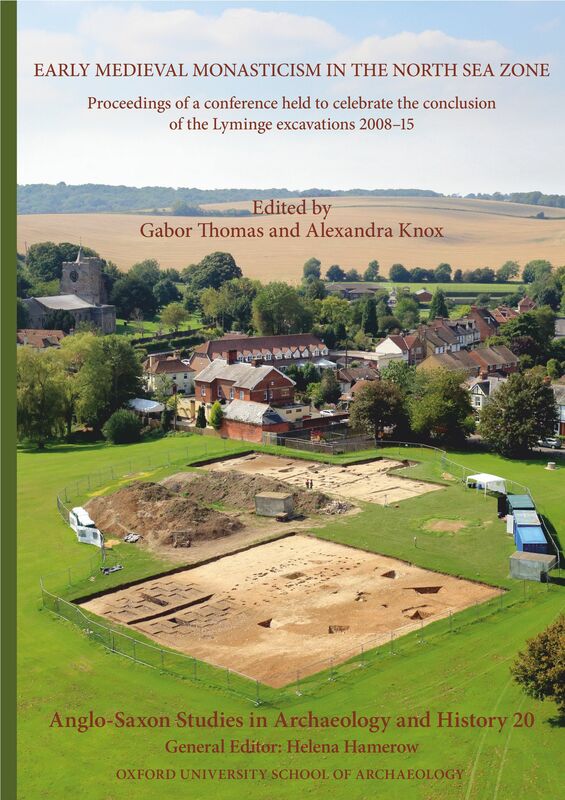 Not only do we have news of the objects, but we would also like to share news of recent and forthcoming publications based on the excavations at Lyminge. 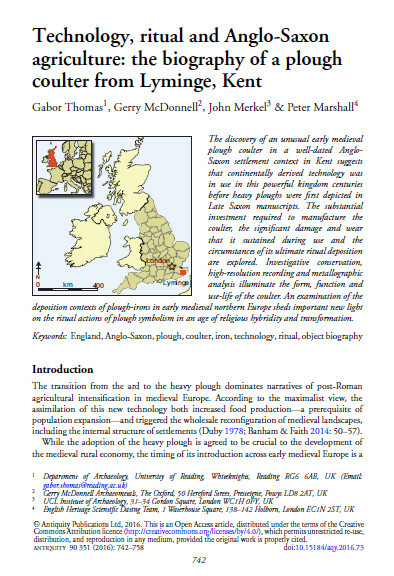 A paper on the remarkable Anglo-Saxon plough coulter recovered from the 2010 excavations has just been published in the prestigious journal, Antiquity. The article is available to view or download Open Access from the journal’s website. We are also pleased to announce that the proceedings of the Lyminge Project Conference held in Canterbury in April 2015 will be published by the end of the year. ‘Early Medieval Monasticism in The North Sea Zone – Recent Research and New Perspectives: Proceedings of an international conference held to celebrate the conclusion of the Lyminge Project excavations, University of Kent, 24-26th April 2015’. We will circulate a post as soon as the volume rolls off the press. 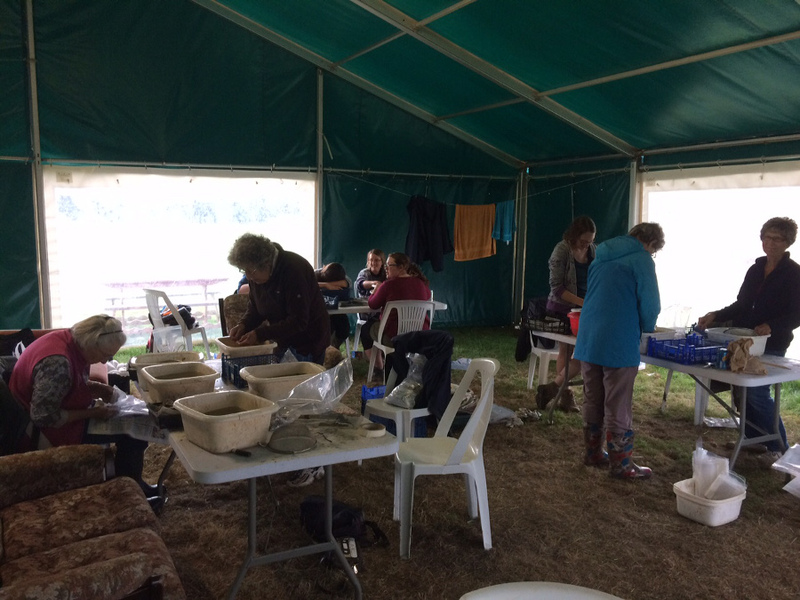 and our fantastic team of local volunteers and visitors, some of whom have been finds washing with us since the first test pits in 2007 and the first large excavations in 2008. We were particularly thrilled, therefore, when a group of our volunteers asked if we would mind if they designed a tapestry to commemorate the excavations – of course we were thrilled! As you can see from the below masterpiece, they recently finished. 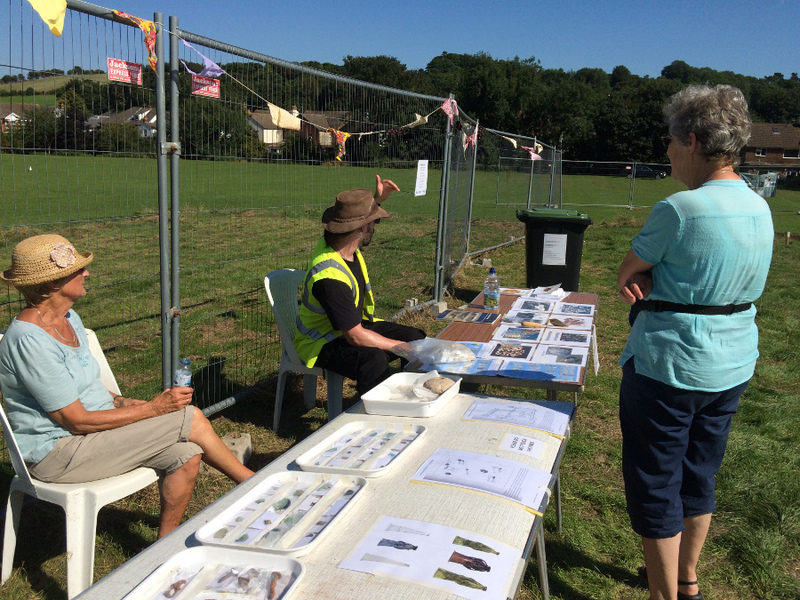 It contains images of the halls and sunken-featured buildings that were excavated on Tayne Field since 2012, as well as incredibly accurate renditions of some of the artefacts, animals, and the activities that would have taken place we uncovered with the help of all our volunteers. 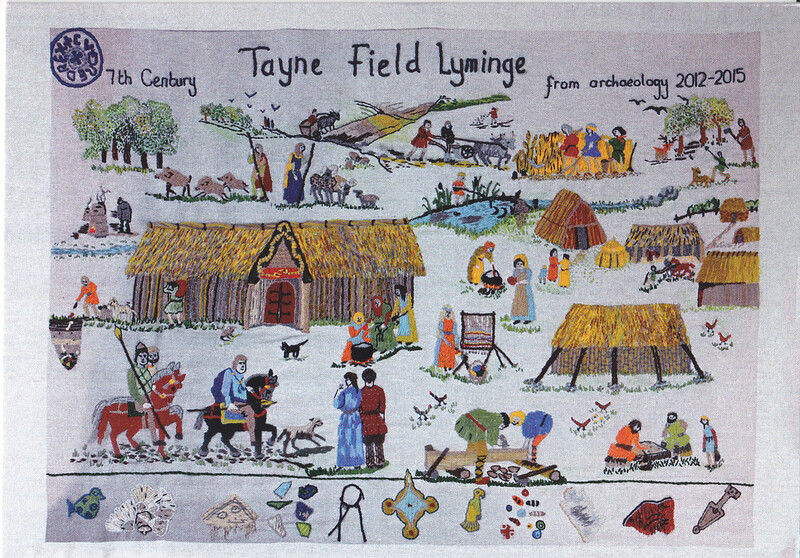 The tapestry is proudly on display in the Tayne Centre across from the excavation site. Huge congratulations to the sewers of an incredibly beautiful piece of work: Maureen Cox, Niki Hunnisett, Eileen Jennings, Margaret Keeble, Janet Reynolds , Rosemary Selman, Pam Sidders, Andree Sladden, Pauleen Stewart, Gill Wren and Katharine Barber with local artist Nikki Barratt who designed the tapestry and Angela Camplin who provided calligraphy in the framing. You might be able to spot objects that have been in the blog, and we have been told that the Director and his family have even been inserted – can you spot them? We wanted to go to Lyminge and have a tangiable impact as well as do some important research. 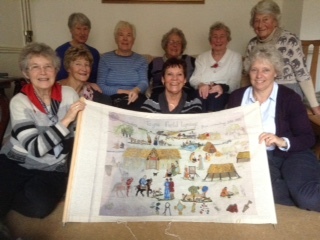 Not only has the team made friends for life, the beautiful tapestry is proof of the positive impact archaeology and history can have on a community. We’ll be back soon to update you on whats happening with the project, and of course let you know when the conference proceedings are published. 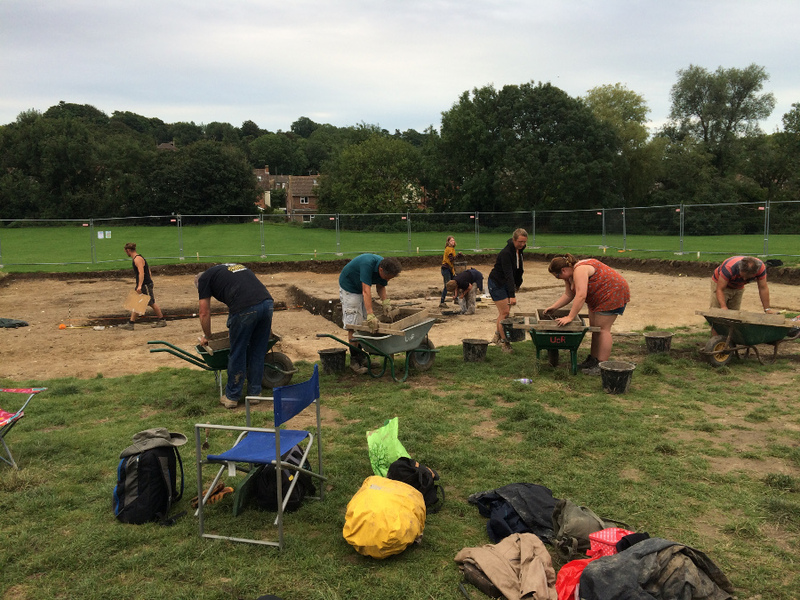 We’re back in Reading, the dust has settled and there is finally time to round up the end of the dig and let you all know how it went and whether we got all our questions answered this summer in our ‘bonus’ excavation season. 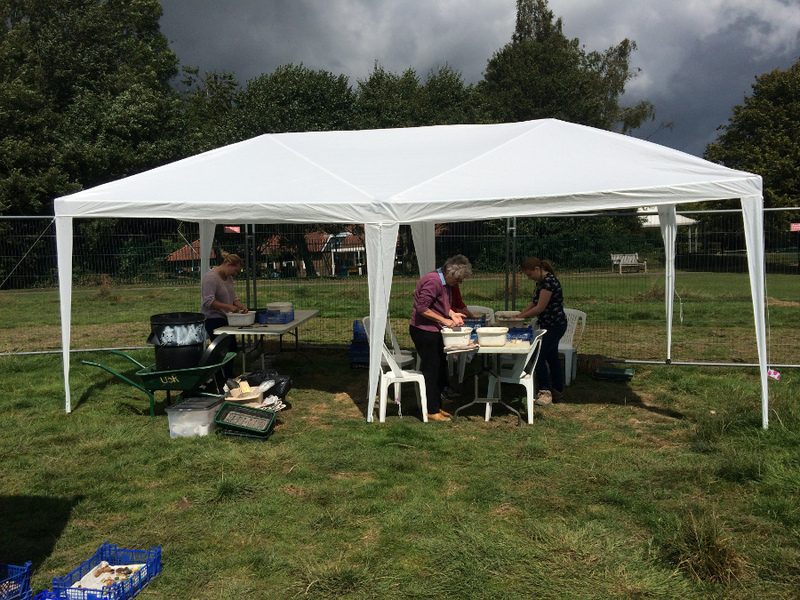 Local community volunteers hard at work finds washing with some ominous looking clouds – this was before our gazebo was lost to the winds! say that we think we have answered all the questions we came back to Lyminge to answer – even if we did get a bit wet doing it! We found some really fantastic objects and archaeology, and had great fun with a really enthusiastic team all dedicated to helping get the work done in the limited time we had. Thank you to all those who volunteered their precious time – because of all our community and student volunteers, our dig was an amazing success. But what of the archaeology itself? 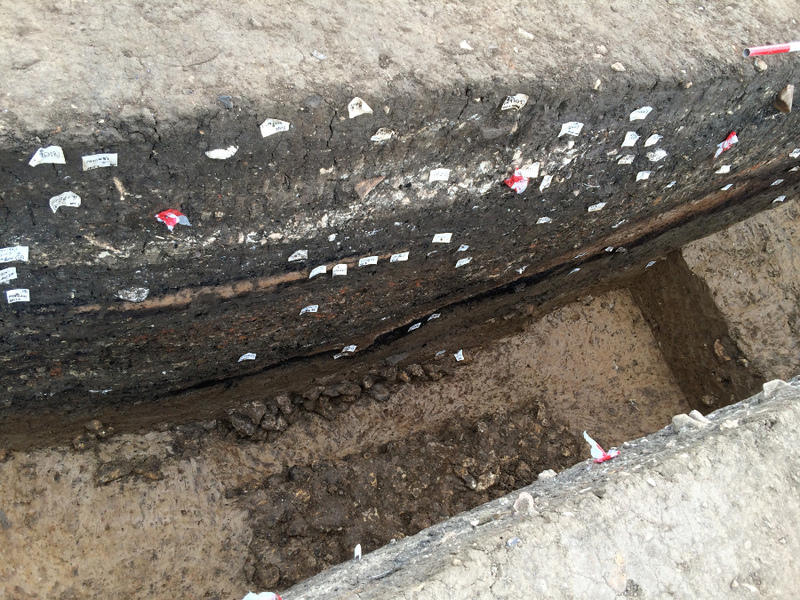 The Timber Hall trench was particularly interesting. 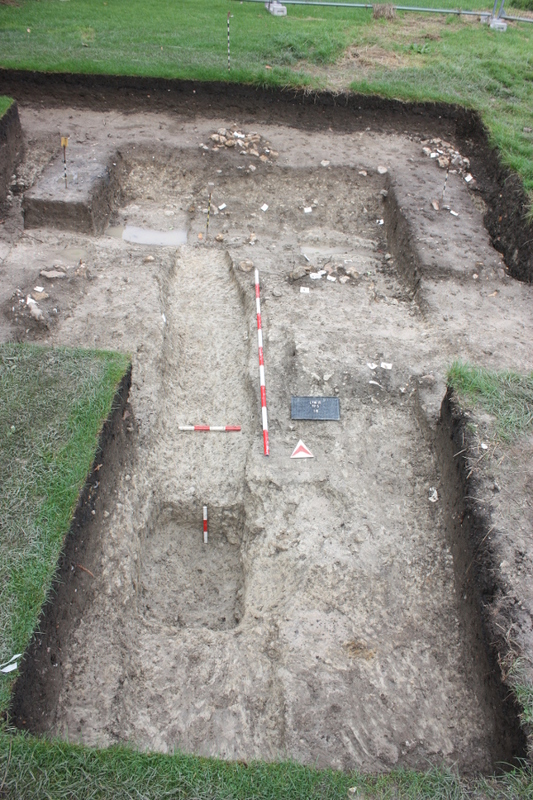 We wanted to open a small trench that would show us the exact length of the east-west oriented timber hall discovered in 2013 and excavated primarily in 2014. 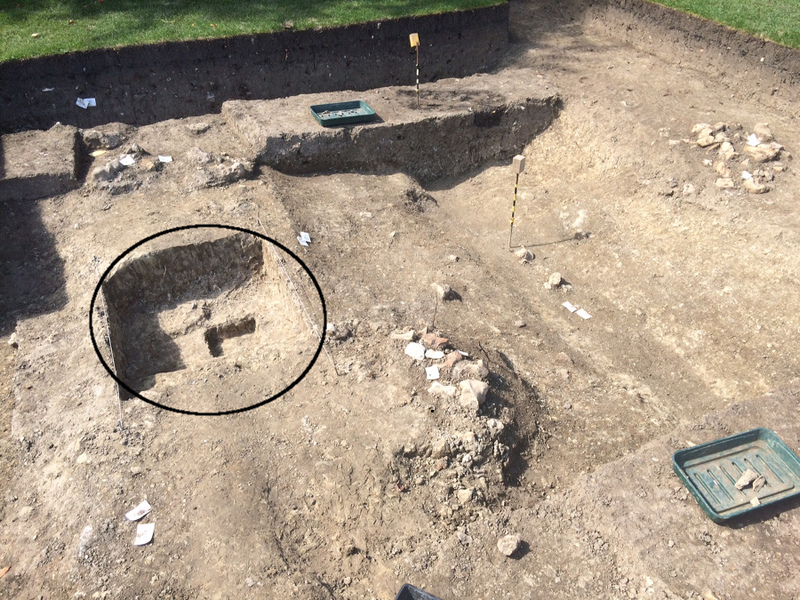 As I have explained in previous blog posts, our volunteers hand-dug a trench over the area estimated (by the position of the doors in the long wall) to be about where the end of the building was, assuming it was symmetrical. This strategy proved the ideal one! 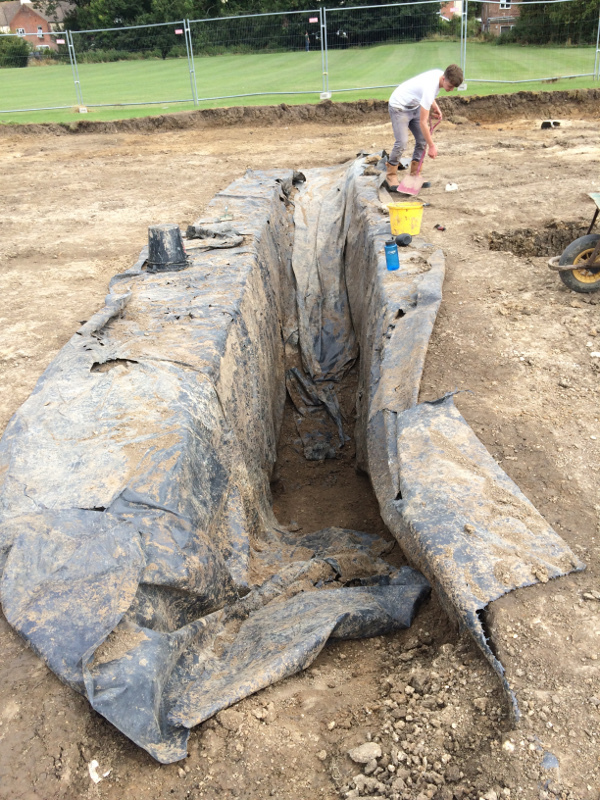 Some say Gabor, our director, has a knack at putting his trenches in exactly the right place, and he did it again! The photo below looks north along the end wall of the timber hall, with one of the red and white ranging poles positioned parallel to the wall trench and the shorter one indicating the width. 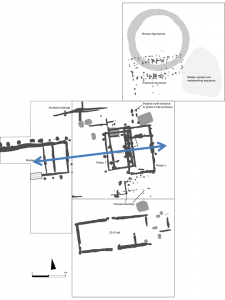 Plan of the 2012-2014 excavations. 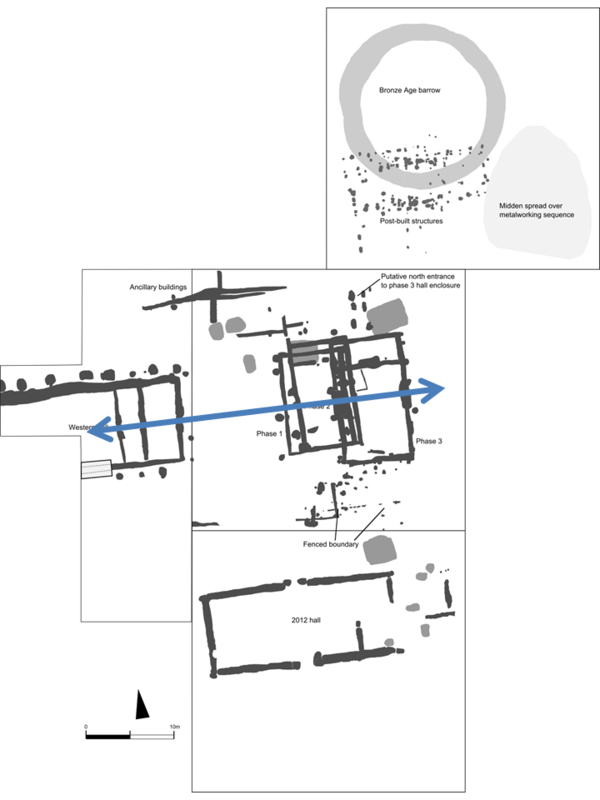 The blue arrow indicates the carefully planned line-of-sight between the doorways of the north-south and east-west Timber Halls. Click to enlarge image. Not only is this structure carefully proportioned and balanced architectually, the entire complex of buildings excavated on Tayne Field line up beautifully. 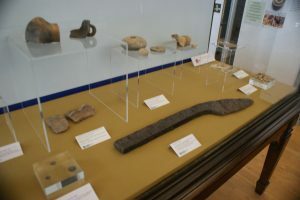 There is a line-of-sight from the western end of this Timber Hall, all the way through to the impressive doorway pits excavates in 2013 in the north-south timber hall. 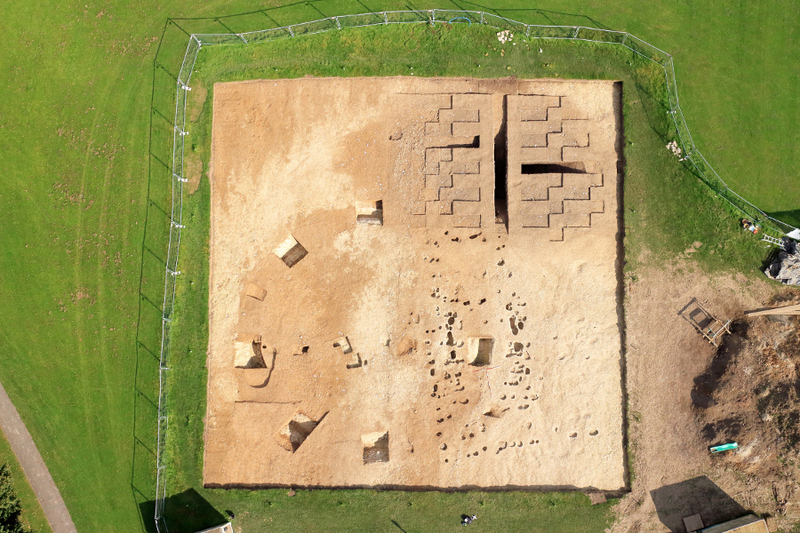 We have at Lyminge an example of the ‘ritual symmetry’ excavated at other impressive Anglo-Saxon royal sites such as Cowdery’s Down, Hampshire, and Yeavering, Northumberland. Finding both the end wall and part of the doorway is a fantastic result and clearly answers one of our objectives for returning to Lyminge this summer. But what of the midden, or the ‘blob’ that I’ve been blogging about throughout August? One of the major questions was the origins of the huge crater-like feature filled with Anglo-Saxon artefacts and the waste from industrial processes like iron smithing and smelting. If you’ve been following the blog, you’ll know that we established that the midden pit was most likely a natural geological feature called a solution hollow or a doline reasonably early on – these are types of sinkholes common to chalk and limestone geology. Because of the slow silting up of the pit, there are flints within the lowest layers of the midden, so we also know that the pit was open in prehistory, most likely sometime in the Bronze Age. Our final question was what on earth the flints (see above) in the lowest Anglo-Saxon layers were doing there. In 2014 we were able to open a 1 m wide slot revealling a layer of what appears to be carefully laid flint nodules in the bottom of the midden. This year, we returned to try and get an answer, and on the very last day of digging we appear to have done just that. While the southerly north-south slot only revealed a gradual petering out of the flints, the northern 2 m wide slot that was newly opened this season at last revealed a flint layer running all the way from the top to the bottom of the blob! Our team worked hard in the last days and even hours to fully reveal this flint ‘ramp’ or ‘pavement’. These flint nodules run from the top north edge of the ‘blob’ and slope down quite steeply into the bottom of our excavated slots. This ‘pavement’ of sorts is only about one or two nodules thick, with smaller flints at the top edge, getting larger as you go down the slope. This suggests to us that they were carefully laid, although there are competing arguments as to whether they could be a natural phenomenon. 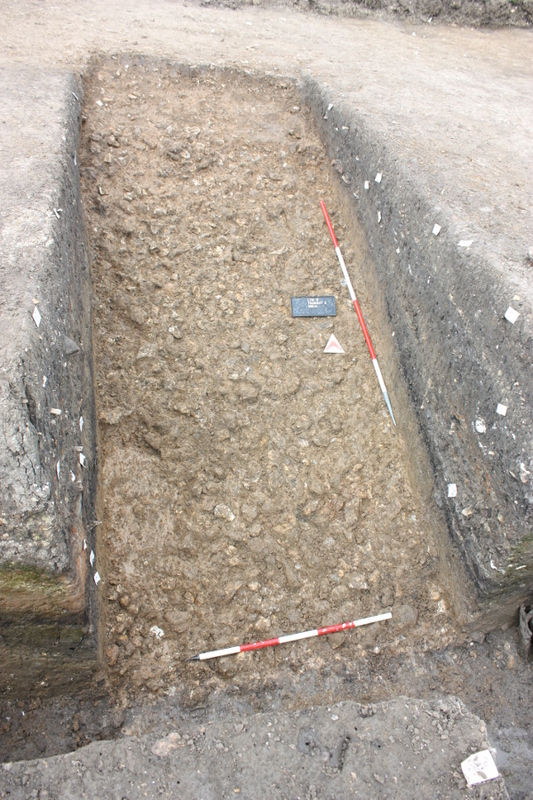 Sink holes or dolines such as the one we have excavated have been found in other areas with flint pavements, although a comparative example excavated at Thanet Earth in 2007-8 is less densely packed than at Lyminge, and much less well sorted. 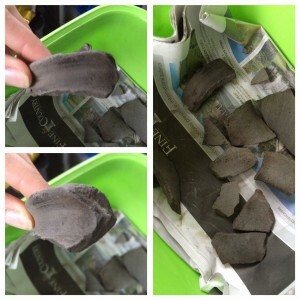 Finds and radiocarbon dates (gathered in 2014) point very much to an Anglo-Saxon use, and the flints are ideal for gaining access to the bottom of the pit without slipping – as we all found out! The southern north-south slot was a slippery nightmare, while the north side with the flints was incredibly easy to negotiate. Although there is certainly an argument for the flints being natural, it looks very much to us like we have either carefully laid flints, or a natural flint area relaid or managed by the Anglo-Saxons to enable entrance to the pit – perhaps even to aid the quarrying of the good quality clay that built up slowly after the sinkhole was formed. Here the flint nodule ‘pavement’ or ‘ramp’ is revealed in all its glory. 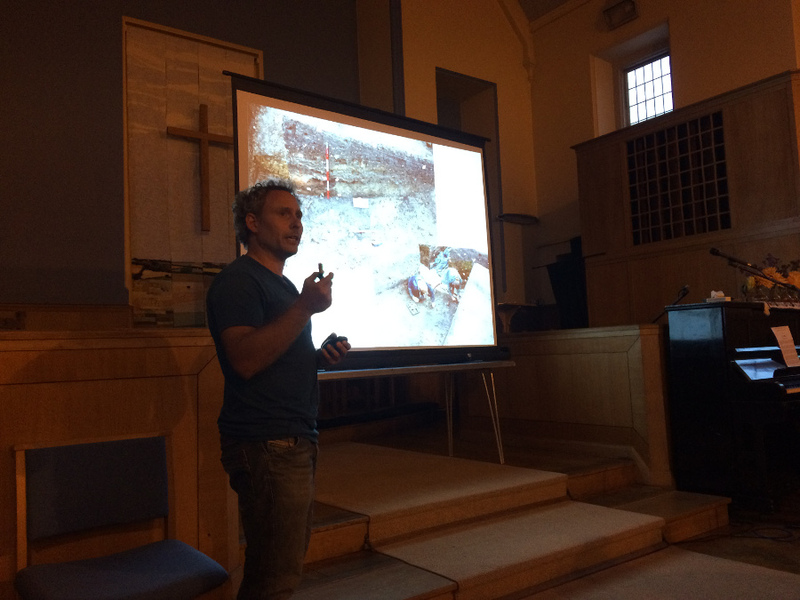 We were thrilled to be able to answer all the questions we came back to Lyminge with – it’s not often in archaeology that you get to answer every research question you set! Usually you come up with more questions than those that you answered, but although of course we have lots of new questions that we hope our post-excavation process will answer, we’re immensely pleased that we had such a successful final season. Gabor presented these findings at the annual end-of-dig lecture, which was fantastically well attended with old faces and new. In fact, the full extent of the flint pavement was only truly revealed the next and final day of the dig, so you heard it here first! 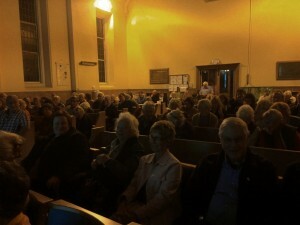 Gabor’s talk also showed some of our amazing finds. 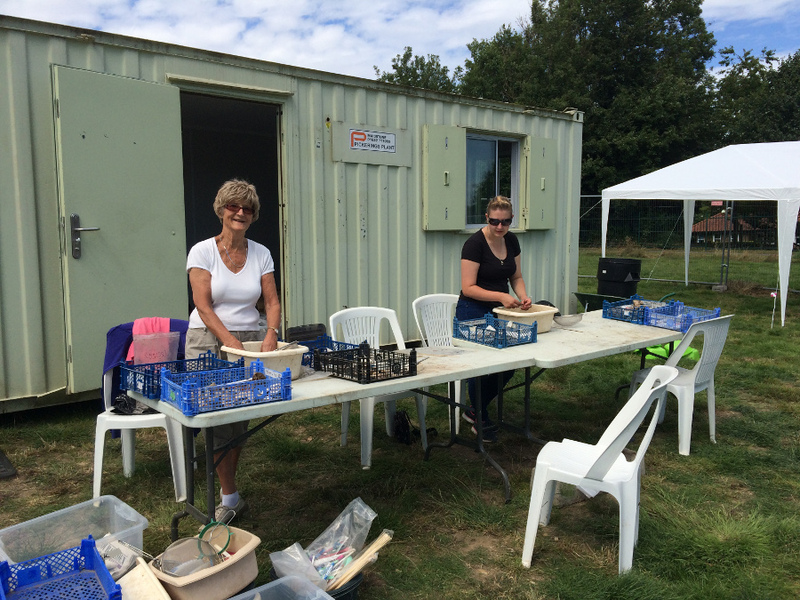 John and Rosemary Piddock provided us with exceptional photographs of the best of our finds (and indeed photographed every single ‘small find’ that came up this summer). Something I have repeatedly talked about in these blog posts is the sheer quantity of glass we have excavated, some 200+ fragments. The quantity and quality is unprecedented in a rural settlement site, and we’ll be focusing on this very much in our post-excavation process. We want to find out why our site has such a high proportion of glass compared to similar royal settlements like Yeavering. As well as glass we had beautiful high status metalwork, with some pieces totally complete aside from the corrosion of centuries, another unusual feature. Lots of work will be done on this, and many of the objects are extremely datable and diagnostic, which will help us to build a picture of the years when the midden was in use. This lovely bone comb (left) was also excavated from the midden, clearly broken at the rivet points, which is where you usually see breakages in these lovely objects. 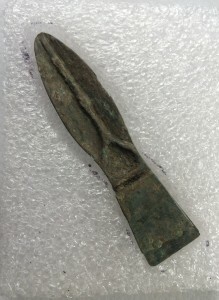 If you want to see more artefacts, you can look through the posts for August 2015 and you’ll see that this season, although short, wasn’t short on finds! Something new for this year was the spectacular iron spear head (written about in an earlier post). 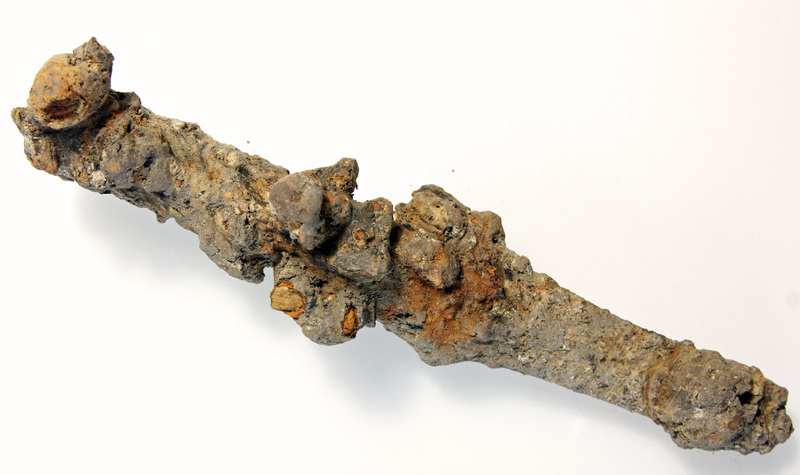 It may not look like much here, but it is the very first identified example of weaponry from the settlement site at Lyminge, despite it’s extensive corrosion and the other materials that have corroded onto it. The annual tradition of ‘Cake Friday’, continued, held on the last Friday of the dig. 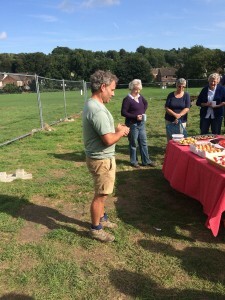 The ‘Lyminge Scrubbers’ as they call themselves, turned out some amazing treats for us all, as Gabor spoke some final words of thanks to our team and everyone who helped in any way at all make the excavations possible. I can’t end this blog post without a mention of our amazing volunteers. Our finds washing team were as ever absolutely amazing, getting through masses of material, including last year’s left over unwashed finds! 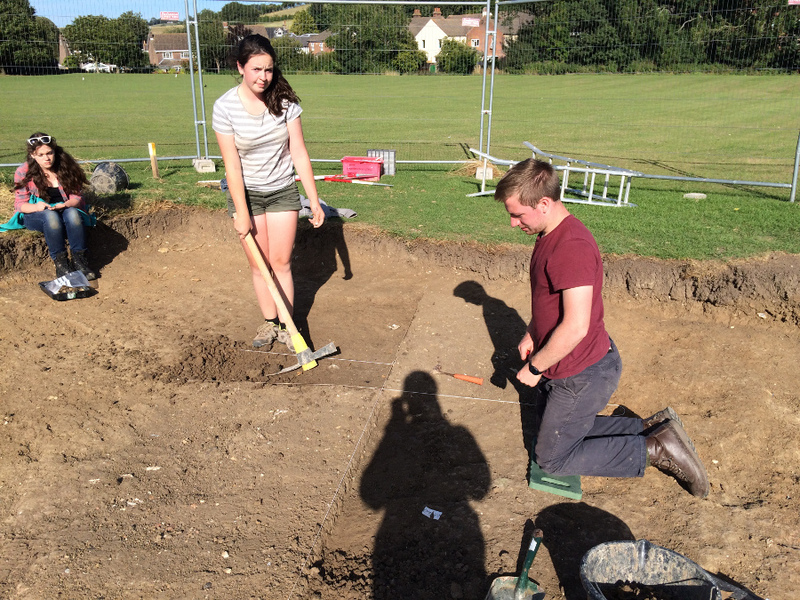 Everyone who dug, recorded, photographed, sieved, washed, dried, measured, drew and wheelbarrowed this summer was invaluable to the excavations and helped make the last four weeks digging in Lyminge a huge success. Everyone gets ready to dive in to the goodies! There won’t be any further large excavations in the village, at least none run by us! The next stage is post-excavation, and there are lots of exciting plans for analysis, publication, dissemination, outreach, education and engagement. The project has submitted an application to the AHRC for funding for this next phase, and we will of course let you all know the results of that application. We hope very much to be back in the village telling you about our plans in a few months. Keep your fingers crossed for a good outcome! That means that this isn’t goodbye, but merely a farewell until we can let you know how our post-excavation phase will work, and what plans we have for keeping the legacy of the excavations alive in Lyminge for future generations. Thank you all for your support over the past three years of digging and blogging, and for your continued support of the project! 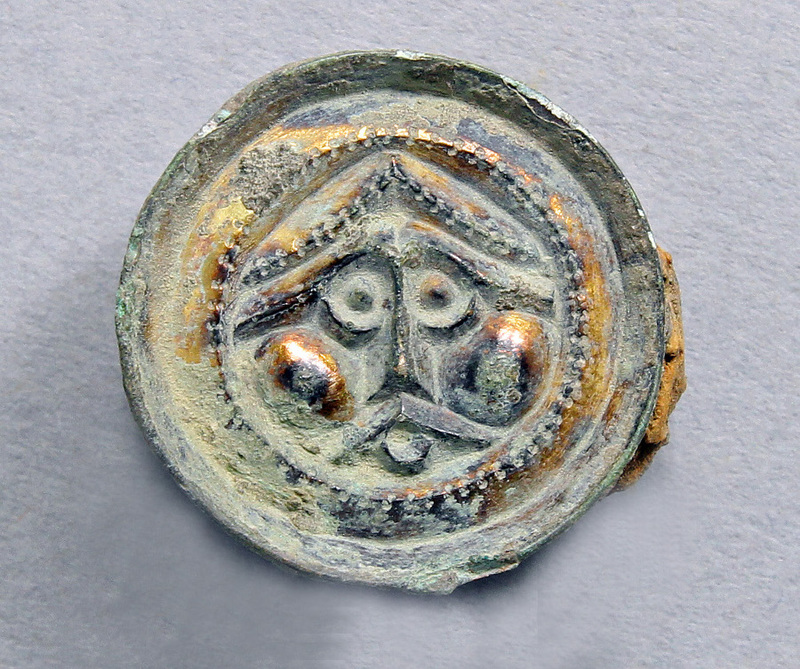 This gilded button brooch I hope is a good luck charm for our grant application – a little anxious but mostly hopeful! The rainy misery continues here in Lyminge, with yet another day rained off after some excellent speedy progress in the brief sunny respite yesterday morning. Our last week digging in Lyminge is looking to be one of the wettest and worst we’ve ever had here! I thought I’d cheers us all up (it’s not just raining in Lyminge, is it?!) and do an Open Day blog post. 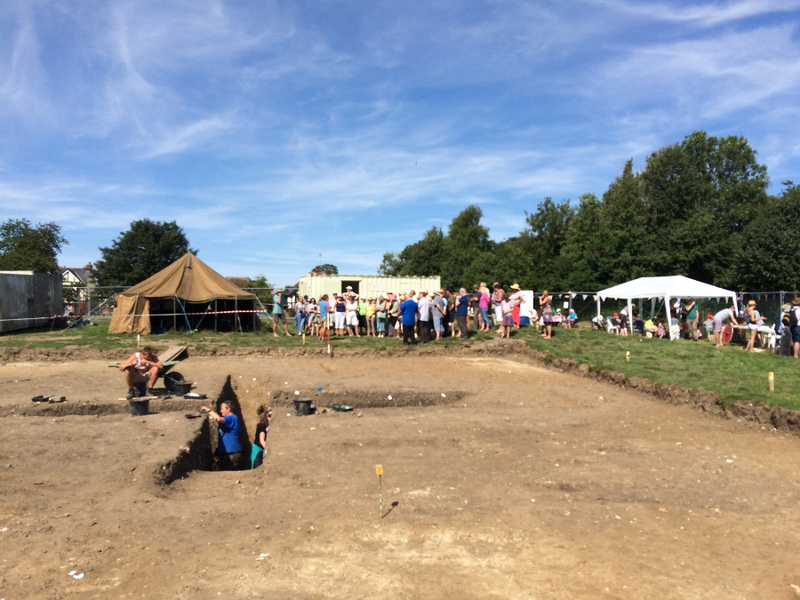 Blue skies and glorious sunshine for our 2015 Open Day – our visitors get stuck in to looking at finds (centre and right) and the children’s Little Dig (left) proves popular! The ‘Little Dig’ that we borrow from Canterbury Archaeological Trust every year in action – always popular! What fantastic weather we had for it! 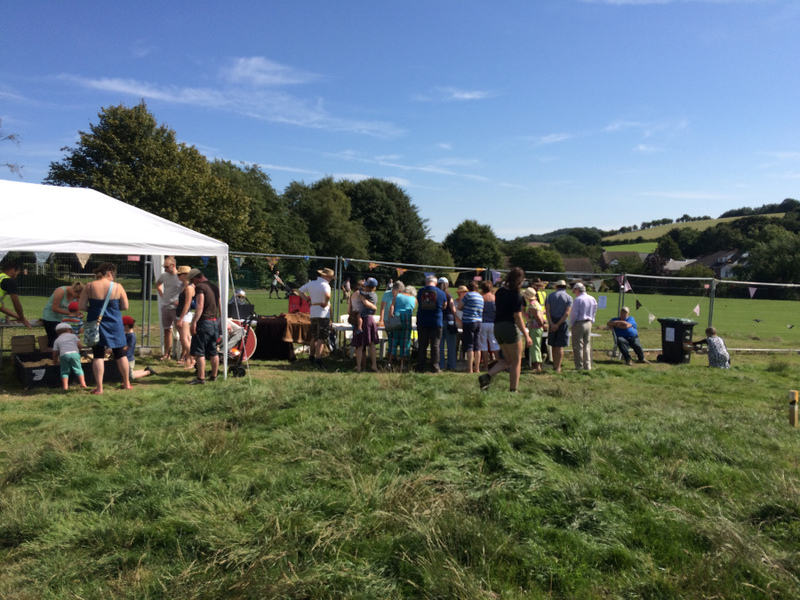 We really got lucky there, and it meant that around 200 people turned out for a wonderful day of site tours, finds on display, Saxon re-enactments and a whole heap of children’s activities. Kids could have a go searching for Roman finds in a specially set up excavation, comparing their finds to a reference collection of real Roman objects (on the table behind the ‘trench’). Who exactly is on display here? 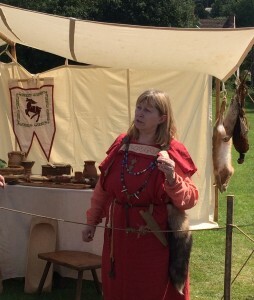 As per usual our Saxon re-enactors from Centingas proved extremely popular with the public – and our esteemed director! One of the re-enactors has had almost the entire Sutton Hoo treasure recreated. He must have been terribly hot, but looked fantastic, so much so that Gabor was keen to try out the iconic helmet and the amazing pattern-welded sword. Gabor took 3 separate site tours over the day, all of which were well attended with both new visitors and those who have been following our progress over the years. Digging also carried on, getting down to those lower layers of the blob. 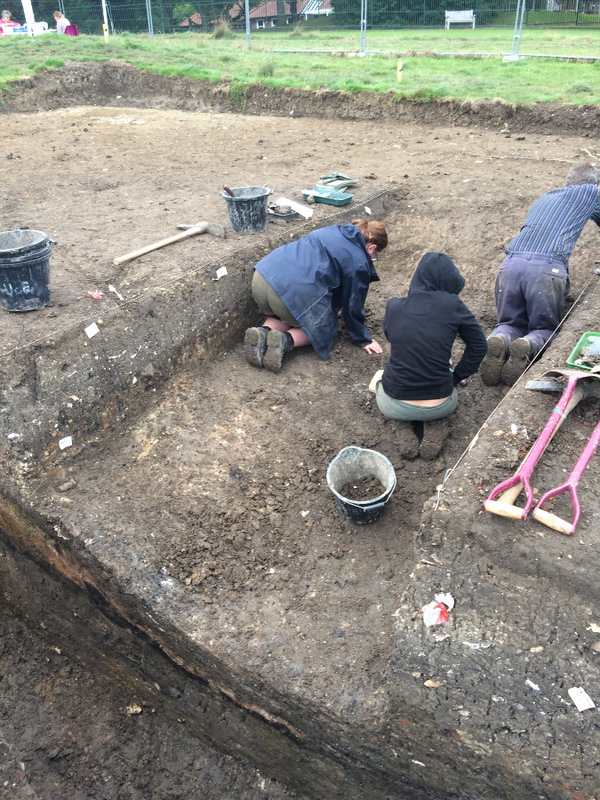 If it wasn’t for the rain, we’d likely be on to recording, drawing and photographing the fully excavated slot by now. As well as finds on display, our PhD student and environmental supervisor came down to help explain his side of the excavations. Here he is below explaining about the information we can gather from seeds, pollen, snails and other environmental indicators that he extracts from floatation and other kinds of sample analysis. 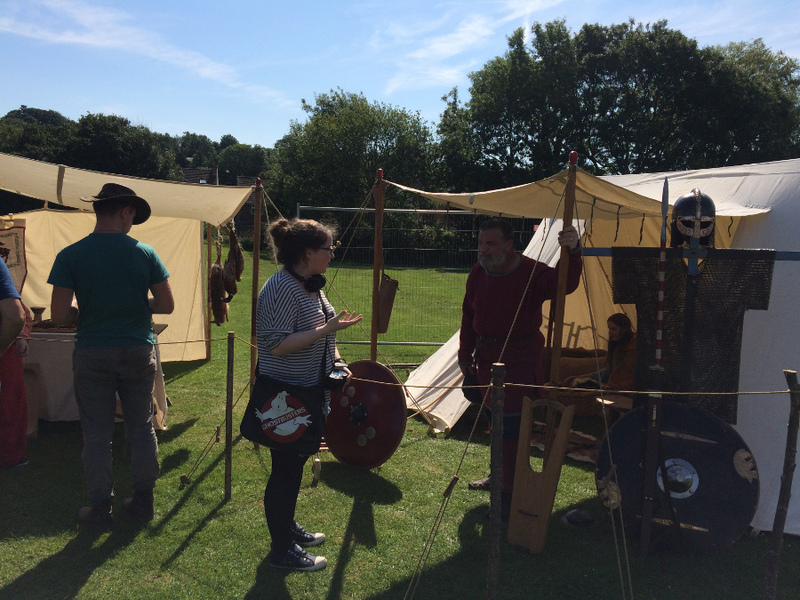 Members of Centingas gave craft demonstrations as well as recitations and talks about Saxon poetry in between the site tours, all terrifically well recieved. Their members really are extraordinarily knowledgable and we always learn lots from each other on the open days. In fact, not only do we learn a lot from each other, we actually have project staff who are Centingas members too! 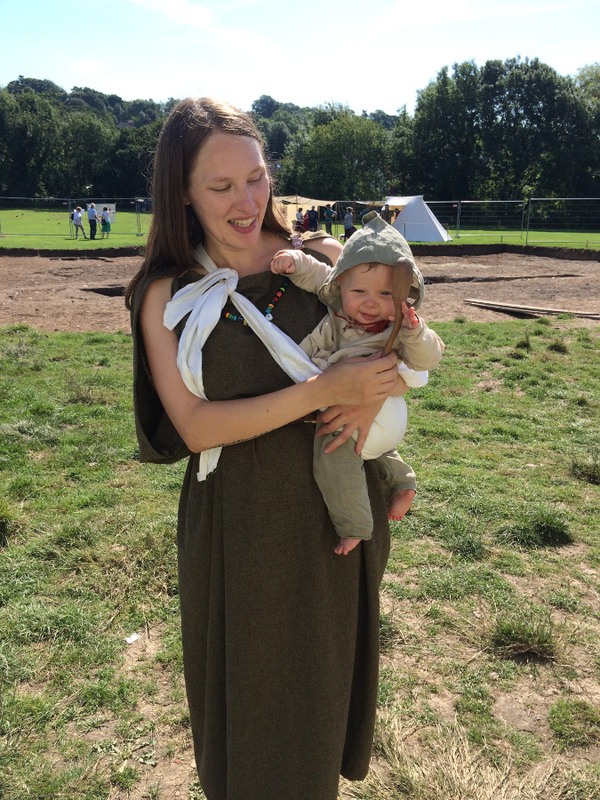 Emily is one of our Finds Supervisors and she and her daughter Aleyna, the ‘project baby’ (also Gabor’s little one) manned the finds table all day, dressed in their alter egos as Saxon mother and child! Aleyna played her part perfectly enjoying gumming on a replica wooden spoon. Emily and Aleyna enjoy being Saxons in the sunshine! We managed to get down to the flint nodules in one area of the excavation, and we’re only one or two layers away from the flints in 2 m wide slot we opened this year. You can see from this photo on the right how busy it is in the trench when we’ve got the right weather! All in all we were terrifically pleased with the Open Day, and we really want to thank all our visitors and supporters for coming along, and of course all the volunteers, students and re-enactors who made it such a splendidly successful day. 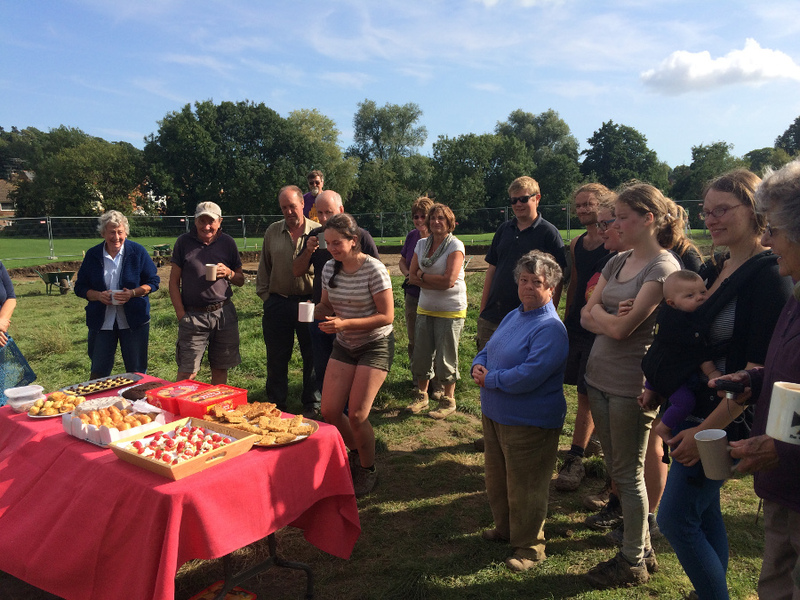 We couldn’t run it without the invaluable support from volunteers and project partners like CAT, as well as our sponsors at the Heritage Lottery Funded ‘Up on the Downs’ scheme. At the moment, however, all that sunshine and jollity seems like a distant memory, as our rather unhappy campers (including me, your blog writer and assistant director!) try to stay dry after four days of almost solid rain. We’ve moved operations to our campsite marquee to try to at least get some finds washing done. After the tragic loss of our finds gazebo (we found it half-way across Tayne Field early one morning!) we have no shelter for finds washing on the dig site, and since digging is impossible in this weather, needs must! Rain doesn’t stop play! Finds washing continues in our campsite marquee to the tune of squeaking rafters as the wind whips up the sides of the tent. I’ll try to do another blog post to wrap up the dig, and fingers crossed I’ll have a little more archaeology to show you! It’s looking like the weather will pick up here in the south-east, so we should be able to get the last bits of what we need to done in the few days we have left. 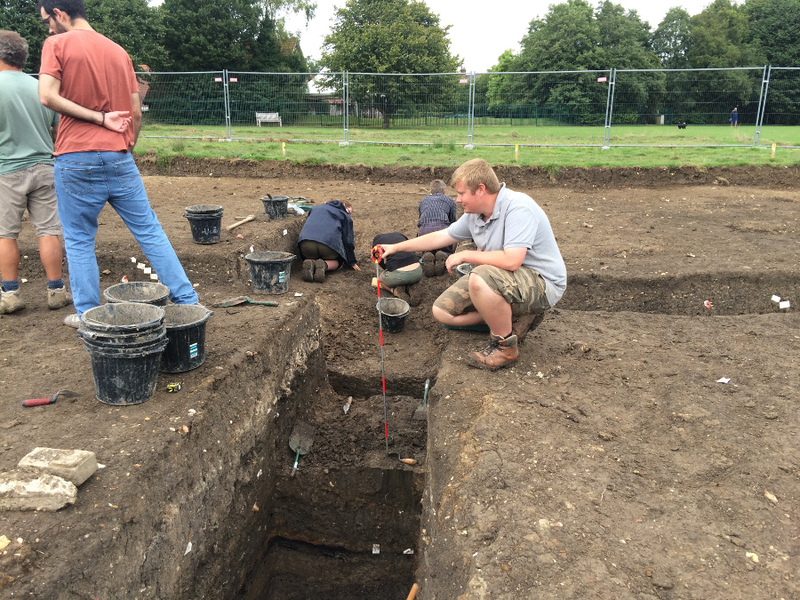 Keep your eyes peeled for what may well be one of the last blog posts of the excavations! Had to finish on sunshine! I wrote the last blog post on the day of epic weather last week. With rain, wind, hailstones and a general feeling of impending doom we had to call off work for the day quite early, but happily until yesterday had glorious sunshine to make up for it! It’s been unusually mixed this year, but so far progress hasn’t been hampered too much by the weather. One of our bright and sunny days in the trench at the beginning of our third and penultimate week of digging on Tayne Field. In fact, absolutely tons of progress has been made since last week, particularly with the Timber Hall trench. We have now managed to confirm that we have the end wall of the hall, which is fantastic news. You can see in this picture below that there is a heap of large flint nodules. This lies outside the external end wall, and the flints provide packing around a raking post to support the roof just like those we excavated on the long walls of the building in 2014. 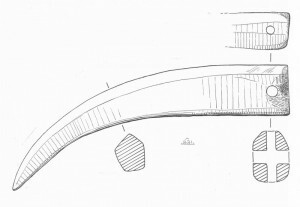 The flint packed raking post on the end wall of the timber hall is circled, and the faint outline of the end wall itself has been marked with two parallel lines. 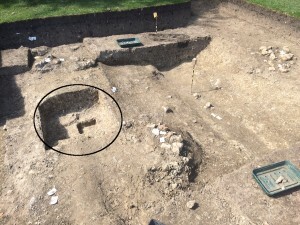 Here a slot has been dug through the end wall-trench and half of a large rectangular ‘post ghost’ (the rotted away remains of a post) have been excavated to show the profile, indicated by the circle. Click on the photo to enlarge the image. 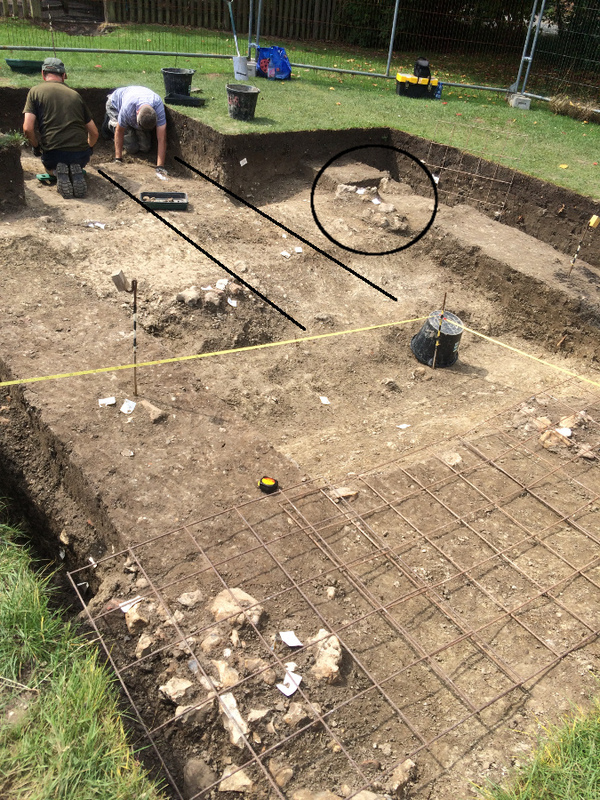 perhaps make out in this photo on the right that there are rectangular dark shapes within the wall trench – this are the ‘ghosts’ of rotted out planks that were placed upright in the wall trench, and are quite large compared to those we have excavated in previous seasons. 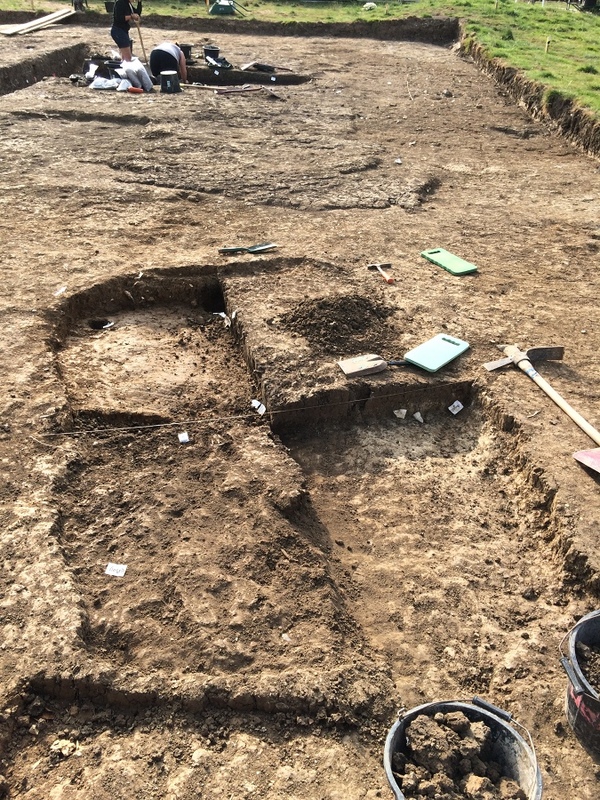 The midden or ‘blob’ keeps progressing – every time we try to pick up the pace with mattocks we start to get more and more exciting finds and have to go back to careful trowelling! The glass fragment tally is now at 135 and counting, and we are now finding pieces of molten glass, highly suggestive of production. 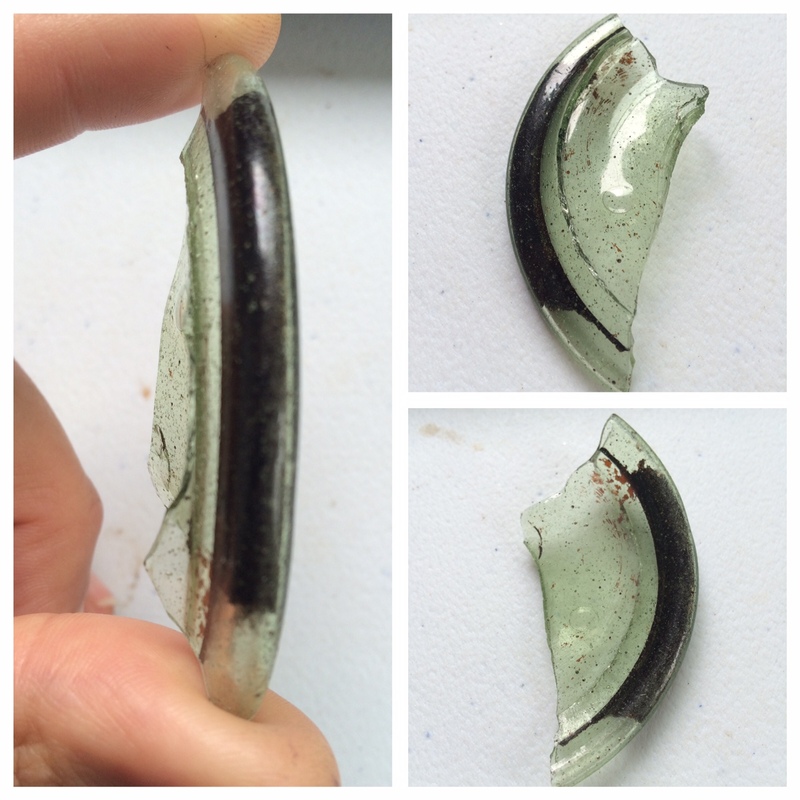 A particularly exciting piece of glass is this large fragment, clearly some kind of base. The bases of glass vessels are extremely rare and this one is particularly large, perhaps up to 10 cm in diameter. Fragment from the base of a glass vessel, potentially a claw beaker. The dark material is soil from its extensive time in the ground. A base of similar size was found at the Ango-Saxon settlement at Mucking in Essex, dating to the 5th century, but our fragment comes from layers that are certainly dated much later than this (particularly by the 6th century metalwork from the same layer), so we’re still thinking hard about this unusual glass vessel. The metal work that has come up from the same layers as much of the glass is of course very interesting indeed! We are tremendously excited to have some lovely complete dress accessories, including some types we haven’t seen here before. Usually dress accessories and jewellery are confined to the cemetery, so it is great to see them in an ‘every day’ setting. 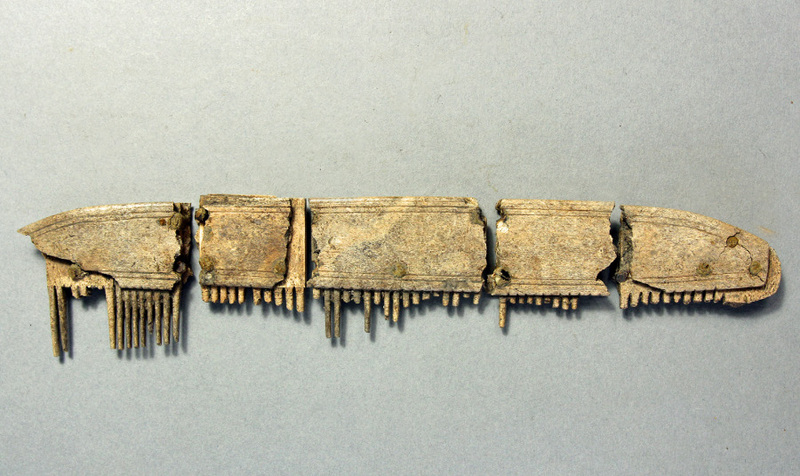 This belt strap-end is Frankish in style and is found both in Kent and on the continent, predominently in graves rather than settlements. 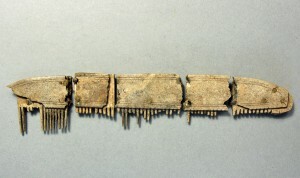 The underside of the strap-end. You can see the rivets which would have fastened on to the fabric or leather. 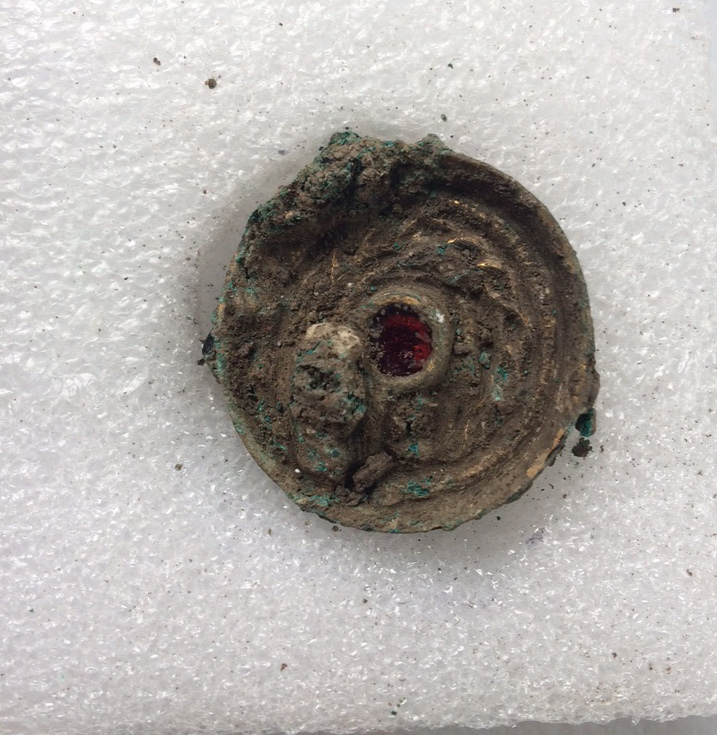 We’ve had a button brooch before, but the one we have recovered this year is from the blob, an Anglo-Saxon midden, whereas last time it was found in a later medieval ditch. This time this jolly little face (if you can make it out!) can give us vital dating evidence for the layer it was found in, and after it is cleaned up it will be obvious that it was gilded. The button brooch, only about 1.5cm in diameter. You can see a stylised face, and perhaps a moustache too! One of the most exciting finds for lovers of ‘bling’, however, is this lovely saucer brooch, below. It is made of copper alloy and is gilded, with a weave or interlace pattern around the stone, a garnet set into the centre of the brooch. There is a little bit of corrosion marring the surface but the overall design is very clear. It is a type that has been found nearby, at the Buckland, Dover cemetery and it dates to the mid-6th century AD. Examples are found on both sides of the channel, and it isn’t clear whether these brooches come from Kent or from the continent. We have found small fragments of garnet before, but this is the very first time we have uncovered a dress accessory with the inlaid garnet still intact! The finds are fab, but this week has seen some really interesting archaeological recovery processes! On the wettest day this week, Tuesday, Simon, our project PhD student studying the environment and landscape of the Lyminge area, and Kevin from Quaternary Scientific (Quest), came to take cores through the midden. Because we aren’t able to dig any further down below the flints, we needed a way to investigate the true depth of the ‘blob’. Some advanced technology was deployed! 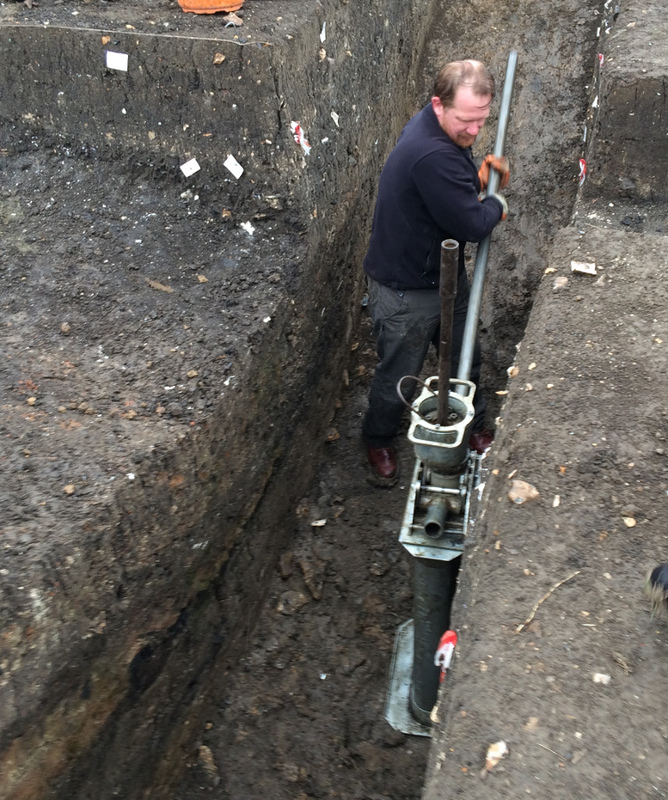 Kev used a percussion corer, powered by a piece of machinery similiar to that of a concrete breaker, in order to take columns through the blob and into the natural geology so we could understand the depth of the crater and potential get to grips with its origins. Two types of sample were taken: a window gouge allows us to look at the core itself as it comes up. This is an immediate result, where we can see in field straight away where the stratigraphy changes and when we hit natural geology. Kev and Simon also took continuous cores, which are sleeved so you can’t see the results straight away but they can be opened back in the lab and used for lots of different types of scientific analysis. We had to abandon digging for the day, as it got so wet, but the coring continued until we had continuous samples through two areas through the midden, which should give us some excellent evidence for both the origins for the crater and for the way in which it was filled up with rubbish and industrial material. The information gained on the day, however, already gives us one of the answers to the questions we had on our return this year. We wanted to find out whether the pit was dug by hand or whether it formed naturally. The window cores taken through the bottom of the central slot show clearly that it is very much deeper than the edges at the centre point, almost a sudden drop off. This means it is very likely that we have a solution hollow, otherwise known as a sinkhole, which opened up back in prehistory, silting up slowly over time and filling up slowly with flints and the odd piece of prehistoric pottery until the Saxons came on the scene, finding a useful hole for their craft working and other industrial processes. The blob continues to give up it’s secrets and we hope to get down to the flints before the end of the dig so that we can work out their purpose – are they perhaps related to the flint working surface we excavated on the edge of the blob last year? We hope the last week or so will answer these questions and more! 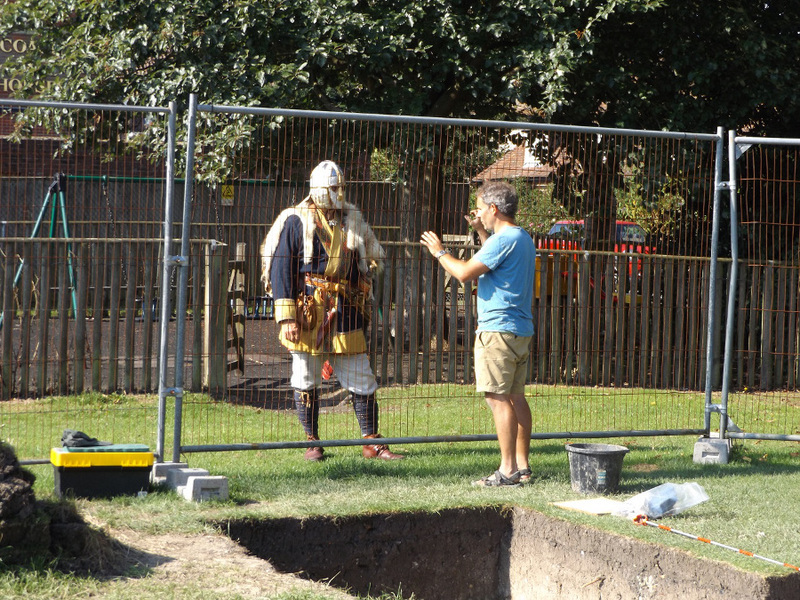 Don’t forget we have a fantastic open day this Saturday, 22nd August, with site tours from Gabor at 11am, 1pm and 3pm, as well as Saxon re-enactment from the Centingas group, a ‘Little Dig’ and other activities for children to get involved in, and of course you’ll be able to see many of these finds up close! Open Day 22nd August 2015! We’re holding an Open Day on 22nd August 2015, from 10am until 4.30pm. Site tours will be scheduled at 11am, 1pm and 3pm, led by dig director Dr Gabor Thomas and there are activities for children including a ‘Little Dig’, demonstrations, and Anglo-Saxon re-enactments. 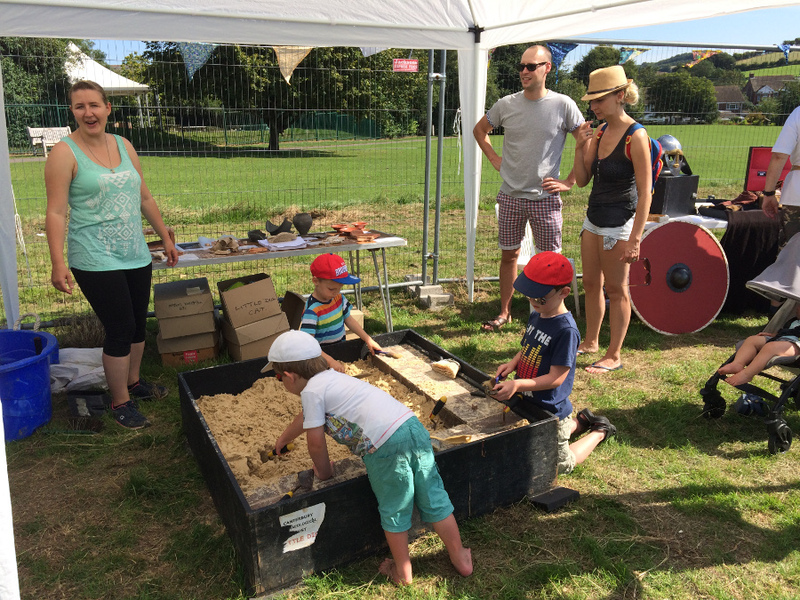 Our Open Days are always lots of fun, so do come along to see the very final excavations on Tayne Field! Week two has brought not only a greater depth to our new slot through the ‘blob’, but an almost endless parade of finds. 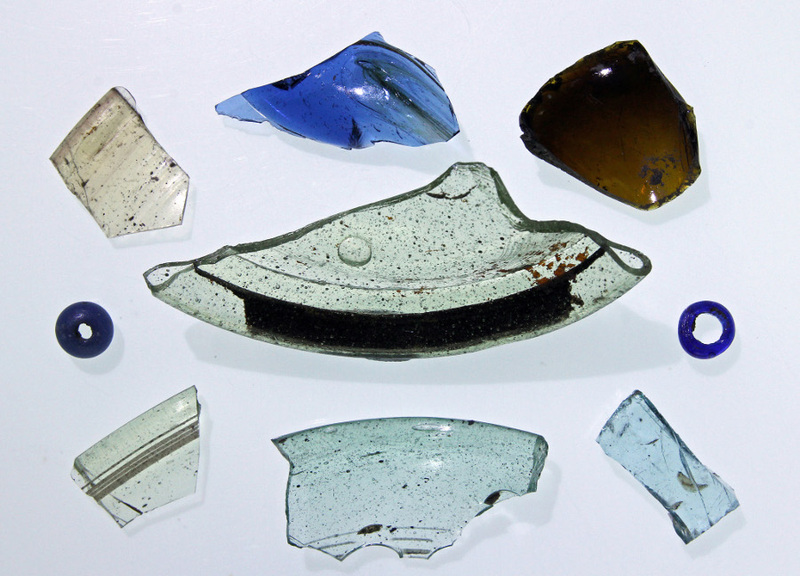 Fragments from glass vessels such as cone beakers and claw beakers are almost becoming run-of-the-mill! We have excavated almost 70 fragments from glass vessels as well as several glass beads. 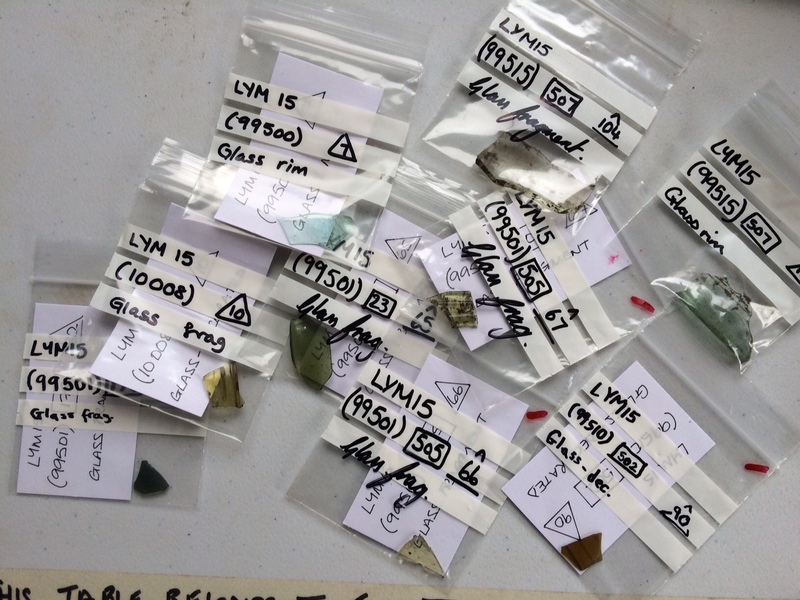 Below are just a small selection of the glass fragments coming up from the ‘blob’…are we looking at a glass production site? The evidence is mounting but we still need something definitive to prove it. 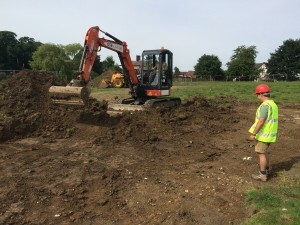 The weather this week has been a little more conducive to some hard digging – last week was incredibly hot and left us all exhausted – especially as we hadn’t acclimatised back into digging mode yet. 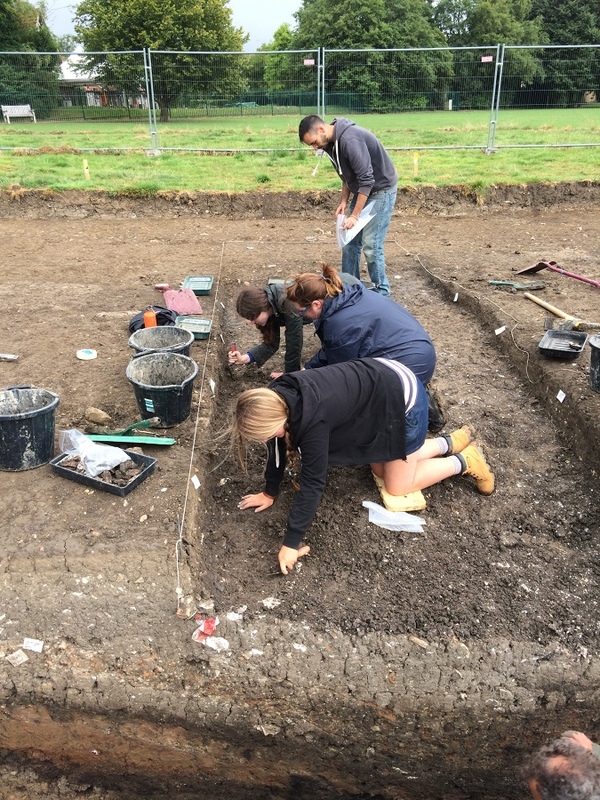 We’ve been able to make real progress this week, getting firmly stuck into the more central layers of the blob and the overnight rain has made it easier to both see the differences between archaeological features and to actually dig! Our aims were to establish an origin for the enormous crater that existed before the Saxons began filling it up. We’re just now getting the first indications that the large hole filled up with such interesting cultural material existed in prehistory, well before the Saxons came to Lyminge. 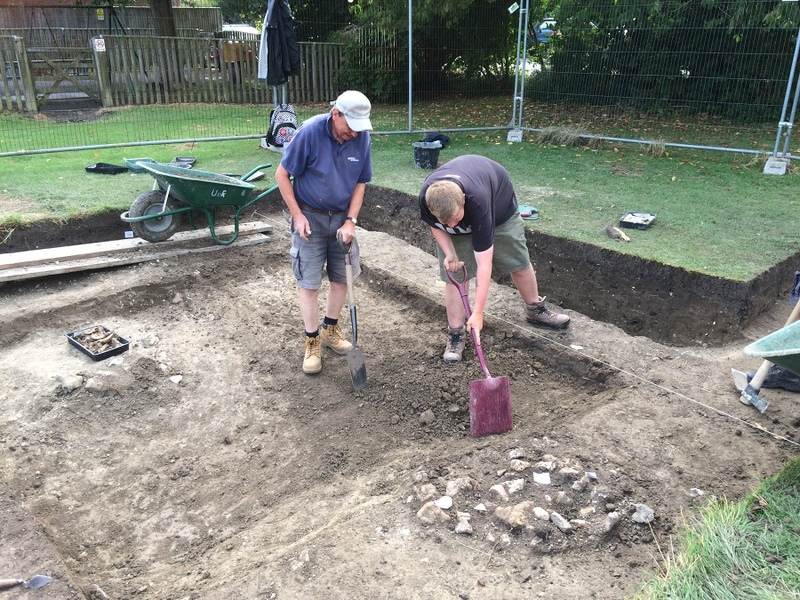 In the north-south trench that was partially dug last year, Dan and Owen are taking back a clay layer that appears to overlie natural chalk. 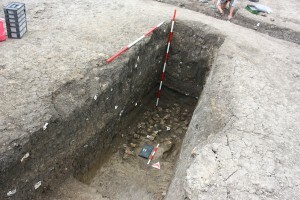 This gets deeper towards the centre of the midden, and is the layer that underlies the large flint nodules packed tightly in the lower layers of the midden. Within this clay, towards the edges of the blob/midden, there are worked and struck flints that look to be Bronze Age in date, and a small sherd of likely Bronze Age pottery backs up the interpretation that this ‘primary fill’ (the first deposit to go in the hole) dates to this period and proves that the hole was dug (or created naturally) in prehistory. 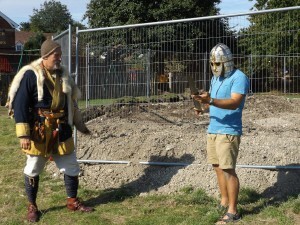 Then it seems that the Saxons came along centuries later and used the open hole for their own purposes! This is great progress in just under two weeks, as we are already starting to answer some of the questions that prompted us to return this summer. 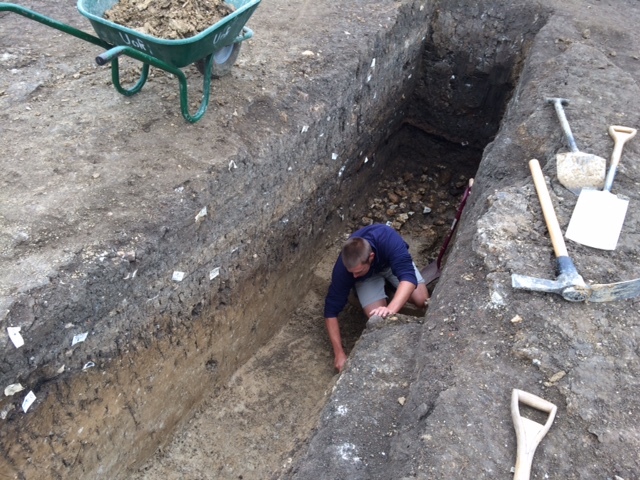 Dan removes the Bronze Age deposit overlying the natural chalk. You can see the flint nodule later behind him, proving the steep slope of the pit at this southern side. 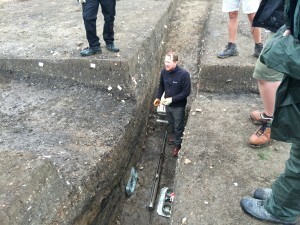 This week also saw the opening of a small trench up by the road. 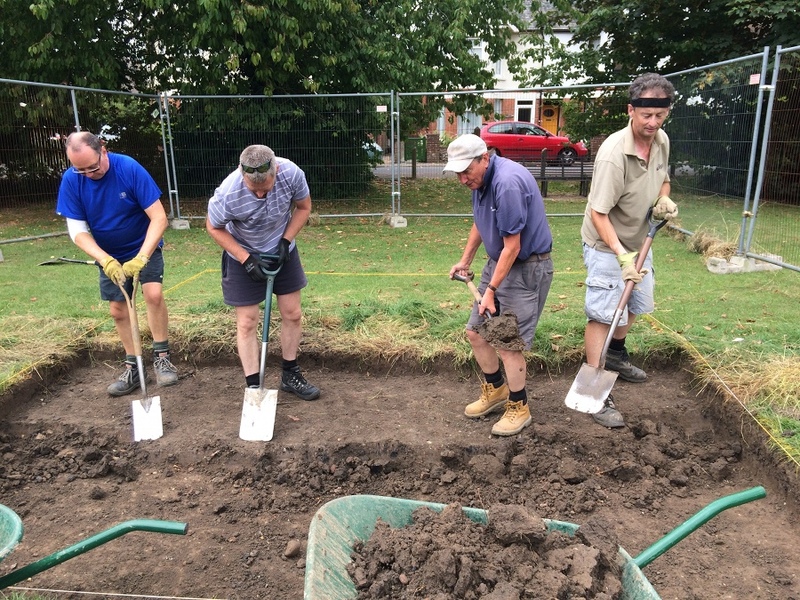 Volunteers from Dover Archaeology Group (DAG) who have been coming to help at Lyminge for several years now have helped us open a trench by hand to locate the western end of the very large timber hall that we excavated in 2013 and 2014. 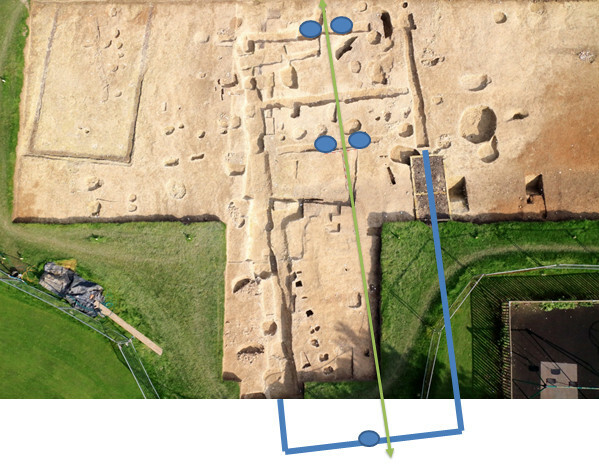 A few calculations according to the location of the door-ways that were excavated last year guided our positioning of the trench and it looks like we might have found the return wall (although of course there are a few other features in there just to confuse us!). 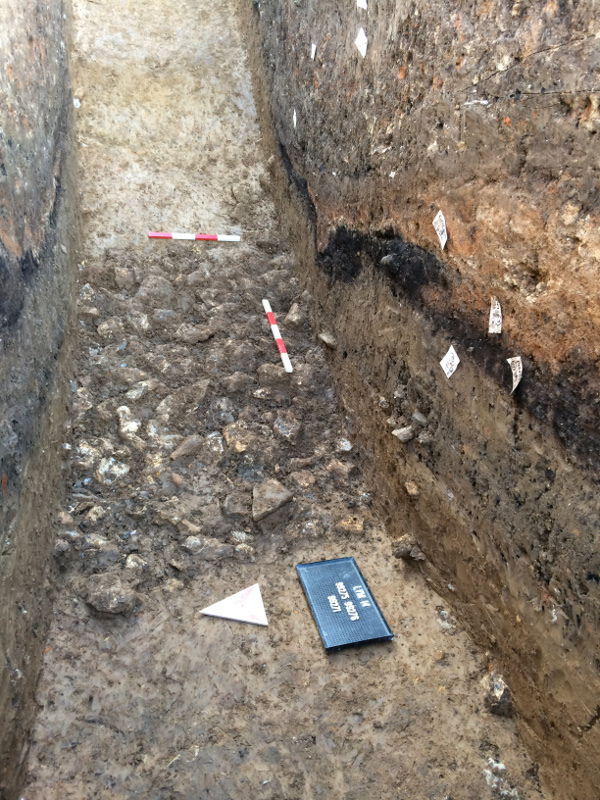 The area in the photo below between Les (with the cap) and the finds tray looks like it contains one of the typical Lyminge plank-in-trench constructed wall foundations, cut through by a large Medieval ditch that we identified last year. 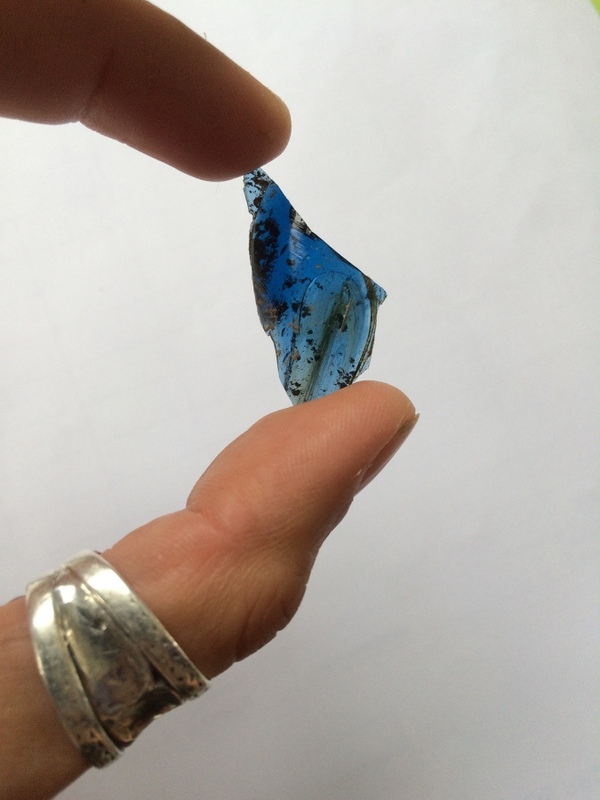 We’ll be disentangling the wall trenches from the medieval ditch over the next week or so, but already there are some really interesting finds, and one that is very special indeed – a lovely fragment of blue glass, from a vessel of some kind. We’ve only had one other blue fragment from Tayne Field so this is quite a find. The excavation of the sunken-featured building is also coming along – we’ve taken it down in quadrants and due to its shallow nature, we’re already on to excavating the last two quadrants (we divided the feature into four to get the best profile through the deposits). 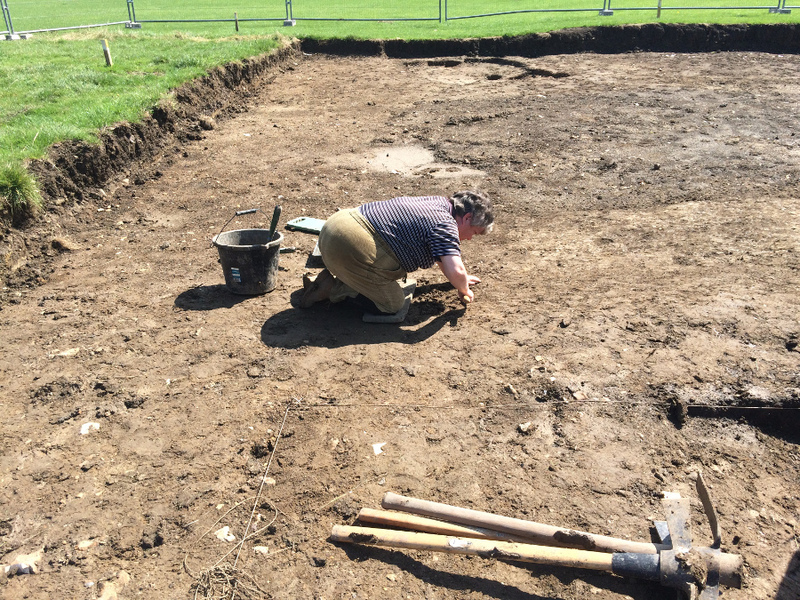 Emma excavates a post hole in one of the quadrants of the sunken-featured building – the 8th SFB we have excavated at Lyminge! 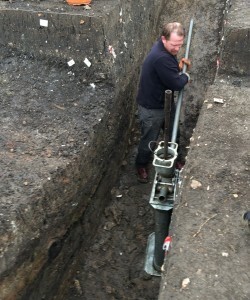 The sunken-featured building under excavation – excuse the loose spoil! Although it is shallow (which is likely why it didn’t appear on the geophysics as well as previous sunken-featured buildings), there are still a few finds, with pottery and a lovely miniature radiate headed brooch, a type we’re seeing regularly now at Lyminge. We are of course still ploughing on with the main new slot through the blob! Along with some of the glass that is pictured above, we’re finding pottery, daub, small pieces of clay moulds perhaps for metalworking and copper alloy objects. Certainly this slot through the midden is proving just as productive as the other areas, and we’re heading down towards those layers that contained ironworking evidence, so look out for that in the next blog post. Work progresses in the new slot through the ‘blob’! Before we wrap up the blog post, we have a bit of a mystery object that came up from the blob this week – we’ve had two other similar examples over the years and thought we’d show you all for any more ideas. The object below is made from an antler tine and is about 10cm long. As you can see it is broken at one end and has a carefully worked hole that passes through the top and out of the side, rather like the hole for a whistle although it doesn’t go all the way through the tine. The mystery antler tine implement discovered in the midden this week. 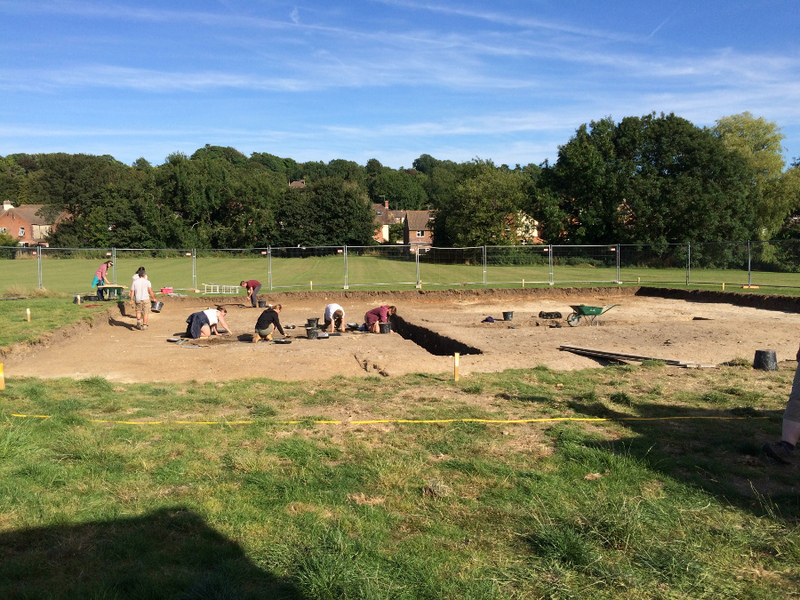 Of the other two examples excavated at Lyminge one was found last year in 2014 and the the other was excavated from an entirely different site, the monastic phase at Lyminge up behind the church, dating from the 8th-9th centuries AD. The notch in the tine from last season is almost exactly the same as this year’s – clearly it had a very specific purpose! We’ve had lots of suggestions including a tool for making nets, or perhaps for tightening something under tension. You can see that the monastic phase carved antler tine is slightly different – it is more polished and the holes are more cleanly drilled. 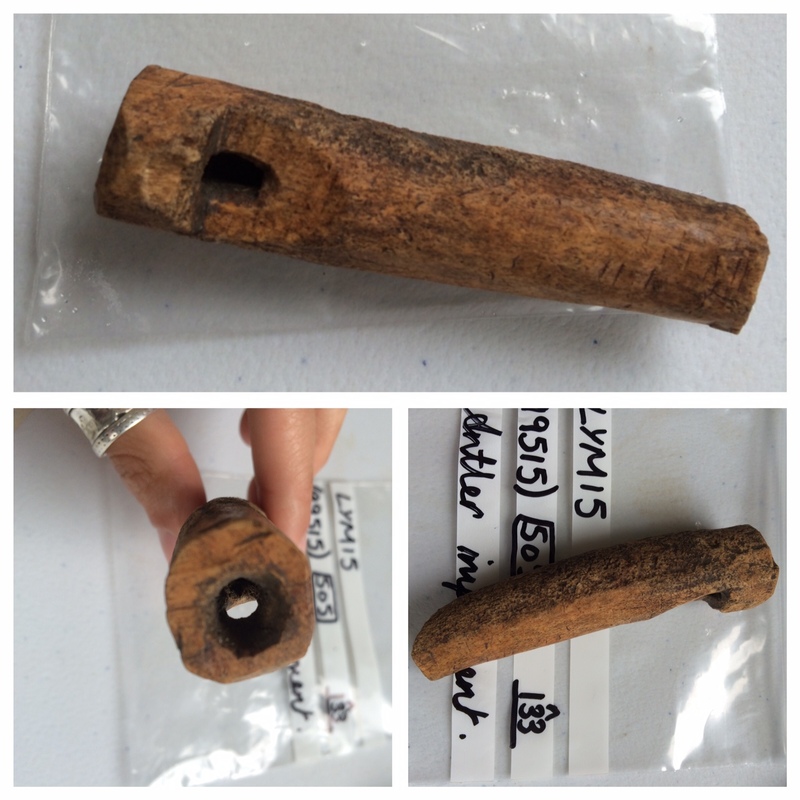 Antler tine tool from the monastic site at Lyminge, excavated in 2009. It has two holes running right through the top of the tine, rather than the one notched hole as seen in the two 6th century examples. 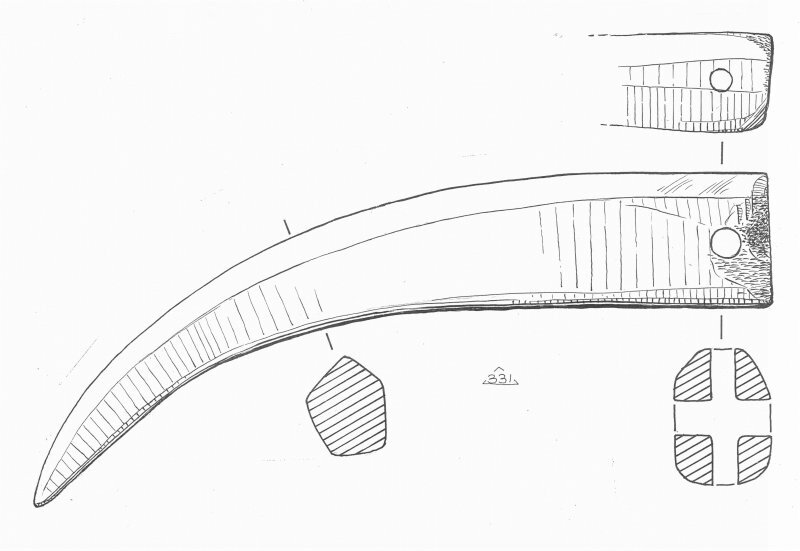 The drawing below shows you how the drilled holes cross in the centre. It’s entirely possible that this later implement had a different purpose as its design doesn’t include the notch cut into the side of the tine. 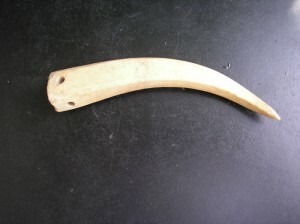 Illustration of the 2009 antler tine tool from the 8th-9th century. Illustration by David Williams. All three objects are about the same size and shape, and feel like they are made to sit nicely in the hand – if you have any ideas do send them this way! We’re making great progress despite the weather we’ve experienced today while I’ve been writing up this blog post – although it does make things difficult for drying washed finds and for digging, as walking over the trench can ruin archaeological features as well as prove dangerous! As we go down into the blob there will be lots more to show you and I’ll keep you updated about the hunt for the western end of the Timber Hall – it’s all looking very promising for the second half of this year’s excavation. 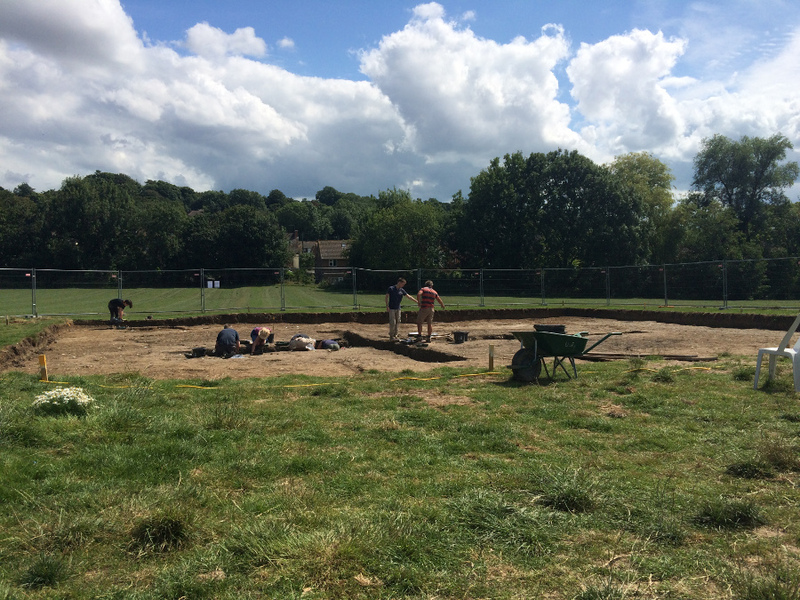 We’re back in the field for an ‘extra’ season, the first time since 2008 that we have returned to open a trench that we have already excavated extensively. Each year we fully excavate the trenches that we open, and until 2014 had no cause to open any of our fully excavated trenches again. Then in the summer of 2014 we made a very unusual discovery, which you can follow through the blog posts from last season and in our recently published and downloadable interim report. 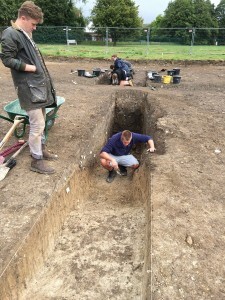 The geophysical survey showed a large dark amorphous blob, and when we revealed it, it proved to be a very large, and exceptionally deep Anglo-Saxon midden, or rubbish pit. We made enormous progress last year, discovering iron working evidence, a hearth and a huge amount of early Saxon pottery, animal bone and vessel glass. We put a 1m wide central slot through the midden, and reached a depth of 1.8m, but we did not find the full depth – a layer of flint nodules at 1.8m depth overlies up to a metre more of sediment. The laid flint nodules in the bottom of the slot dug across the huge midden pit in the south-east corner of Trench 1 – dug as far as it was safe to go, and indeed possible within our 6 week dig! We knew we had to come back to find out the origins and extent of this highly unusual feature! We are lucky to have been successful in our application to the Up on the Downs HLF scheme, and along with a private donation we are able to be here for four weeks this summer to investigate those remaining questions with a small group of volunteers. 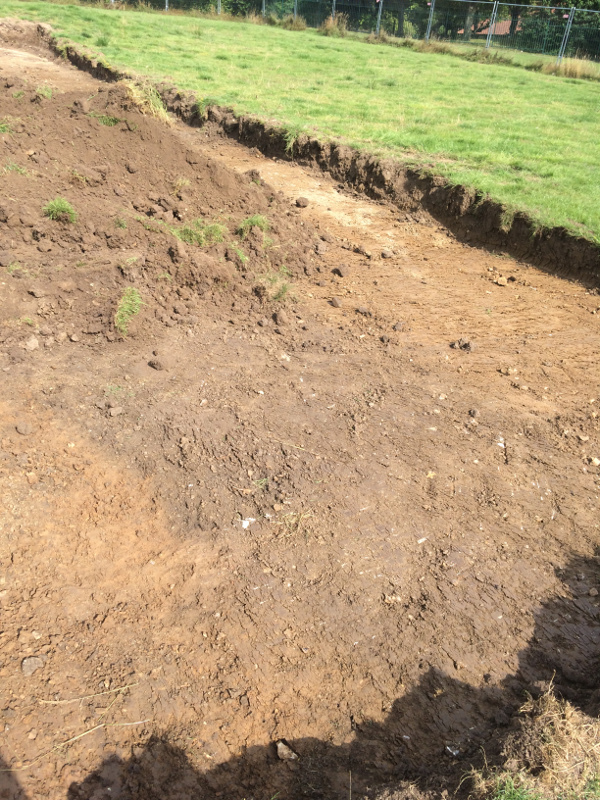 The dark area in the top right of the trench (south-east) is the midden, surrounded by an orangey clay. 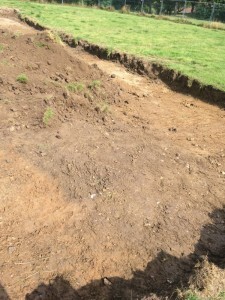 This is a pre-excavation shot of the 2014 trench. 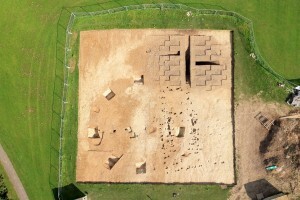 The larger circle in the bottom left of the trench is a Bronze Age ring ditch. shorter dig to put another north-south slot through the midden, on the north side of the central east-west slot, in the hopes of being to expose more of the flint nodules (their purpose is at present unknown) and to establish the origin of the ‘crater’ itself. Was chalk quarried away? Did a completely natural geological event cause a sinkhole to open up, which the Anglo-Saxons then took advantage of? We hope to be able to get closer to answering these at least! We started cleaning back the trench in earnest on Monday afternoon after we’d set up our dig infrastructure, revealing the archaeological features that we excavated last season, and cleaning up the backfill from them. We dug out the remaining backfill from the deep trenches through the ‘blob’, which we had covered with black plastic to make cleaning up easier in case we wanted to return. The cleaning of trench went quickly and we’re now well into excavation, starting to take down the slot in the north part of the midden, and already finding interesting artefacts! Our wonderful team of finds washers are also back in force, getting to grips with both the new material coming up and with some of the finds that didn’t get washed at the end of last season – there was such a lot of material that we had to take it back to the department, and even with a team of undergraduates working hard on processing it, we still had unwashed finds to bring back to Lyminge! Getting stuck in to finds processing already! There were also a few surprises in the areas that we haven’t excavated before. 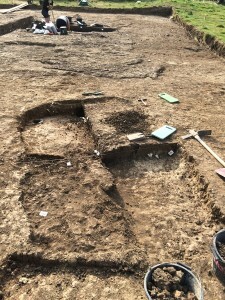 Several new post holes and what seems to be another sunken-featured building (a type of structure typical on Anglo-Saxon settlement sites with a rectangular pit beneath it) became apparent as we machined away and then hand-cleaned the trench. The SFB is a surprise as it doesn’t show up on the geophysics, and all those we have excavated in previous seasons have been present as clearly defined black rectangles on the geophysical plan. It appears to have been backfilled with clay, very similar to the clay the SFB pit was dug into, which may be one reason that it isn’t as clearly defined as the others we have excavated. This structure is our 8th SFB at Lyminge, and has the potential to be contemporary with the midden. 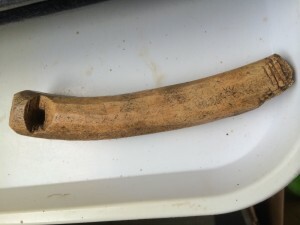 So far, even though it is full of very difficult-to-dig clay, there is a great deal of animal bone in it and we already have a nice whetstone for sharpening knives. 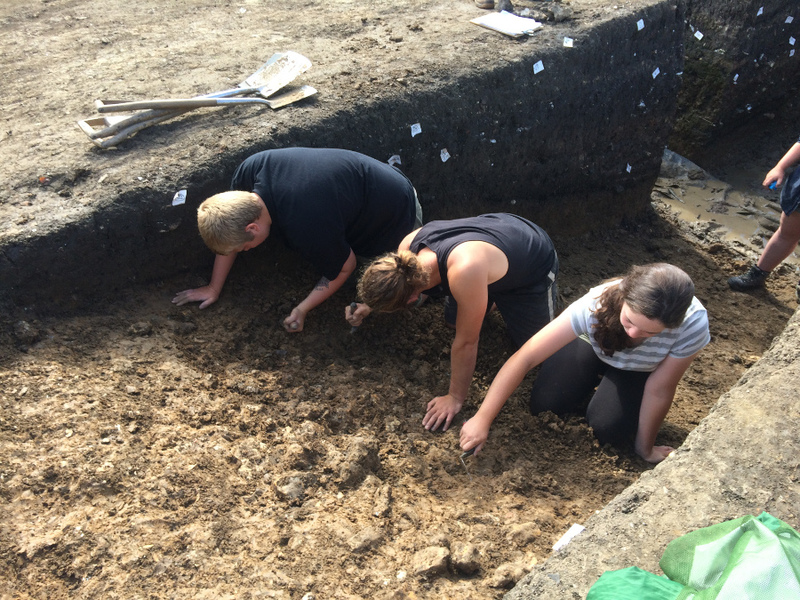 Hannah, Emma and Piers getting to grips with our clay-filled SFB – usually mattocks are a no-no here but the clay is impossible to trowel! Last year one of our supervisors from Canterbury Archaeological Trust, Keith Parfitt, put a slot through the southern half of the ‘blob’, locating the flint nodules once more. 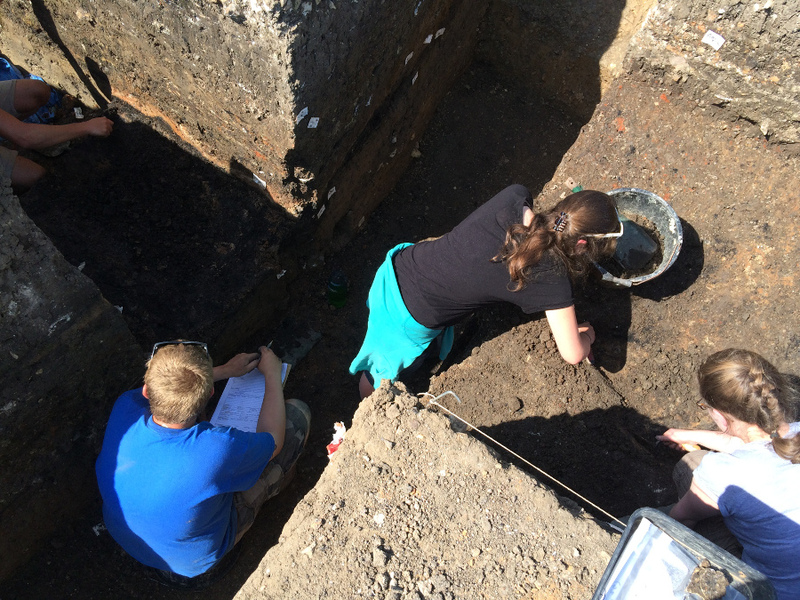 He wasn’t able to fully excavate that slot and we now have two student volunteers completing the task. A great deal of animal bone was found towards the lower layers, which provided us with some very early radiocarbon dates of the 5th-6th centuries AD, and Dan and Owen are finding yet more of this feasting debris, along with some Roman pottery (not unusual in Anglo-Saxon contexts). 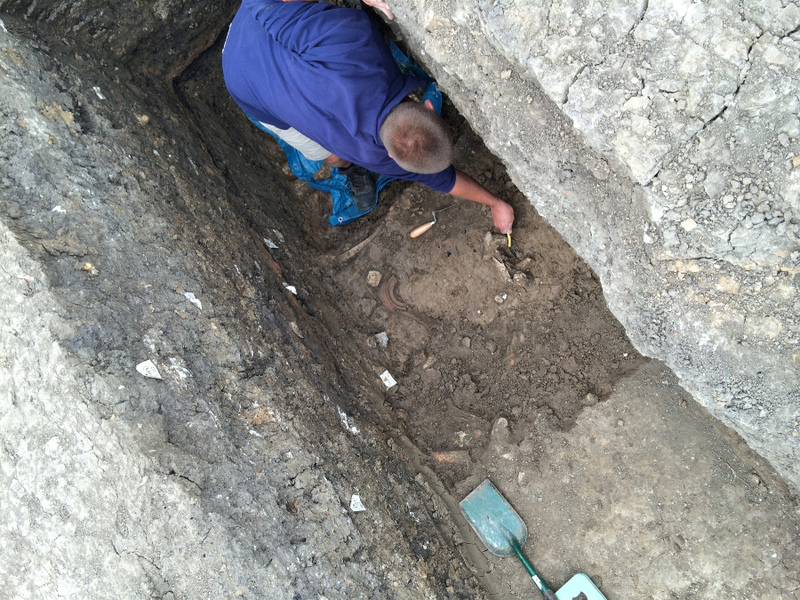 Dan cleans up around lots of animal bone and a rather complete Roman pot rim in the southern N-S slot through the blob. The pot is in the centre of the photo. 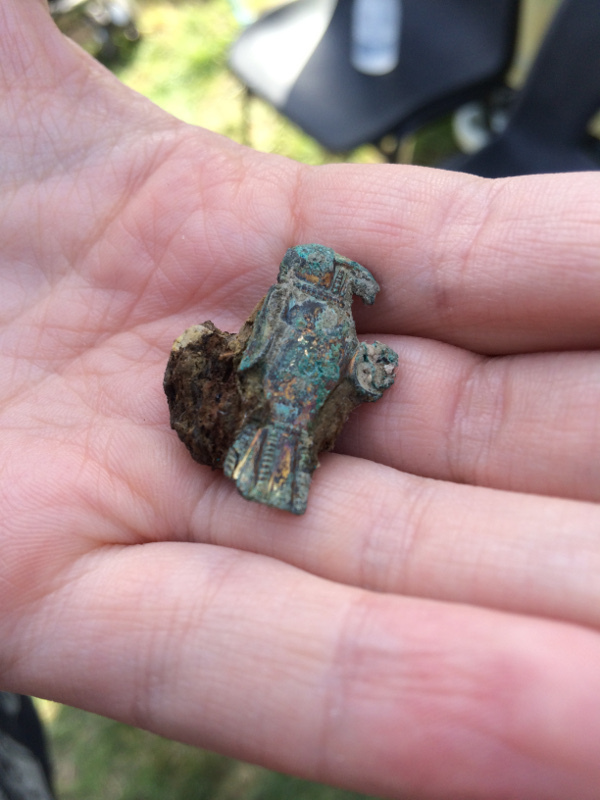 With all the excitement of digging comes new finds…and of course one of the weeks most spectacular finds comes not from the excavation but from the finds washing team! We do sieve all of the material that comes up carefully but sometimes things do end up in finds trays. This amazingly complete brooch came up early this week, discovered in a bag of unwashed finds from LYM14, still extremely well preserved with its iron pin still attached, although corroded. It is a stylised representation of a raptor (perhaps a hawk or an eagle), and dates from 530-570 AD, in the Frankish style. The brooch even has gilding (you can spot this on the tail feathers), and once properly cleaned and conserved should show up beautifully. It is yet another fantastic example of high-status artefacts to come up from the blob, adding to our picture of Lyminge as an important royal centre with links to the continent. The slot that we have begun opening in the northern half of the blob is already turning up fascinating artefacts. 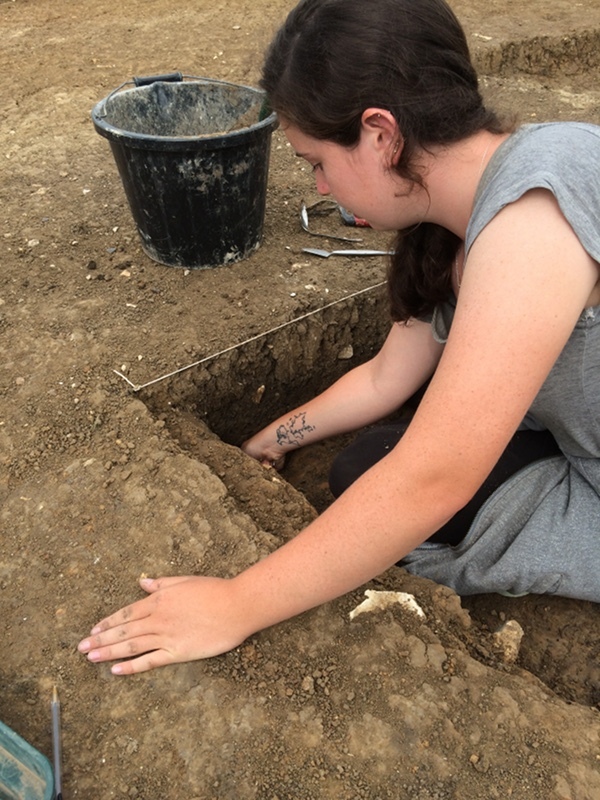 Not only are we getting the usual supply of animal bone, pottery, daub and slag, but a very unusual glass bead has was excavated just yesterday by one of our student volunteers, Jess. Unusual glass bead or pendant, excavated from the midden. It is broken along the suspension hole which runs lengthway through the bead. It is flat in profile, rather than the rounder beads usually found, and the hole for suspension runs through the diameter of the bead rather than piercing the centre, making it more of a pendant. 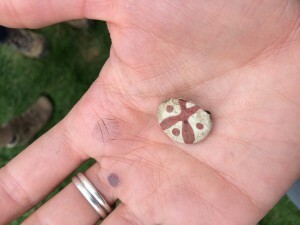 It is broken, but you can still clearly see the cross and dot design, and adds a pop of colour to the usual greys and browns of pottery and animal bone that we find in Anglo-Saxon sites! If anyone knows of a parallel we’d love to hear about it. 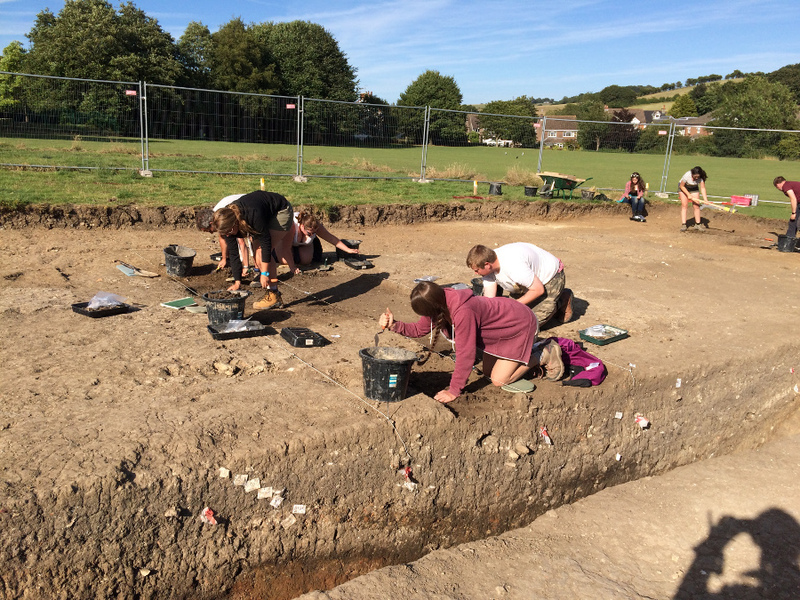 You can see that we have started in earnest and are already turning up some amazing archaeology and the artefacts to go with it – even though we have opened a smaller trench and have much more specific goals this year. We’re well on our way to answering the questions last year’s dig left and to adding to the amazing assemblage Lyminge has turned up year on year since our investigations began back in 2007. 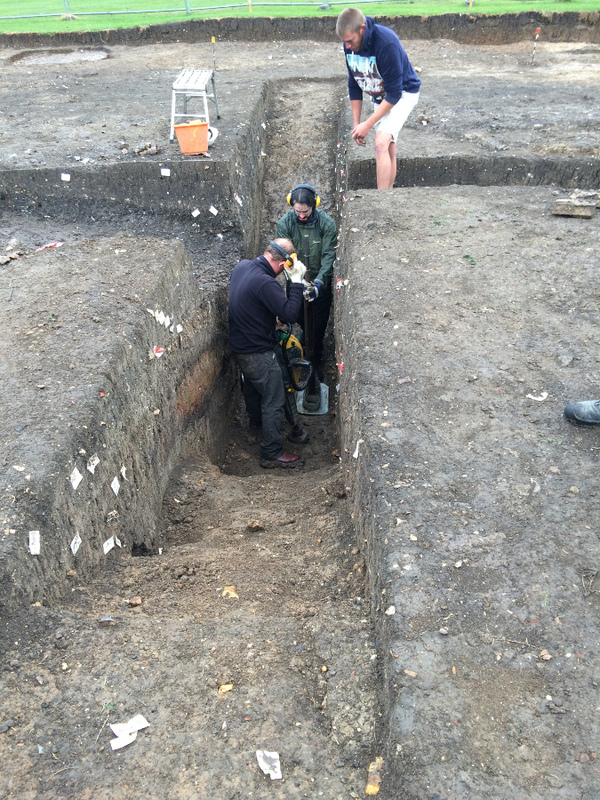 Week 1 and our smaller-than-usual trench is well under way! Don’t forget that there are weekly site tours at 2pm on Saturdays, and that Saturday 22nd August will be a full open day from 10am to 4.30pm. 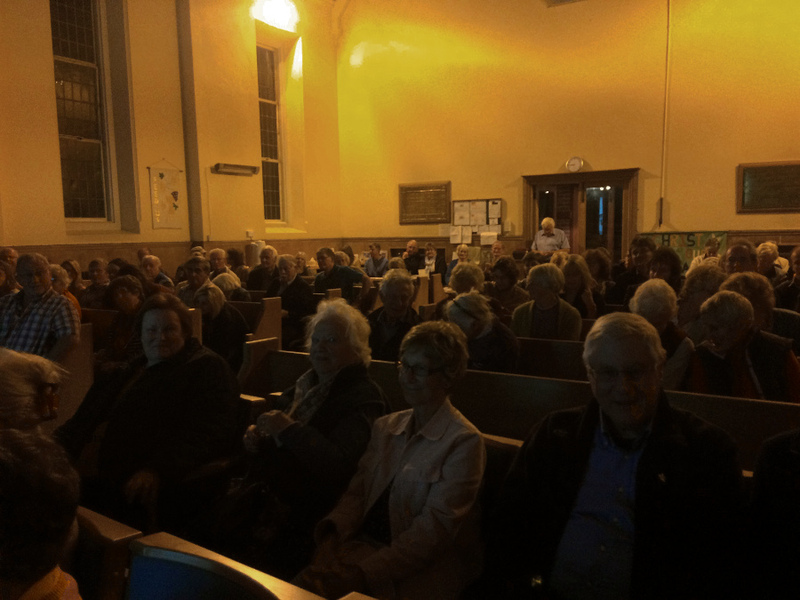 We look forward to your visit, but if you can’t make it, we’ll be blogging as often as we can! 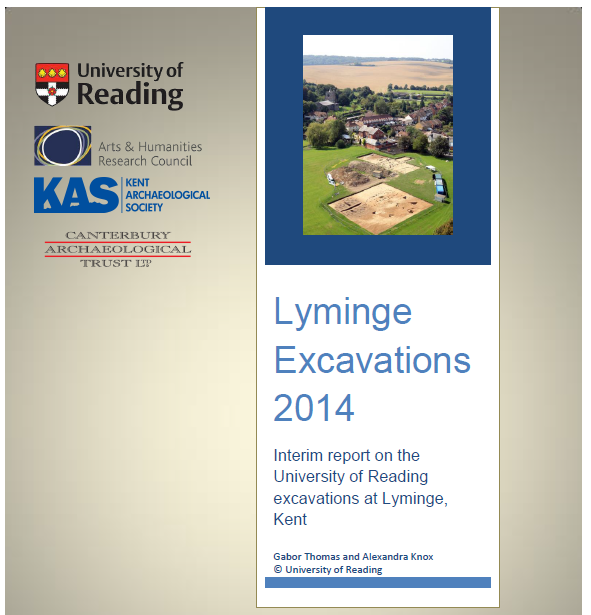 Lyminge 2014 Interim Report now available! We still have a week until the beginning of the (very very!) 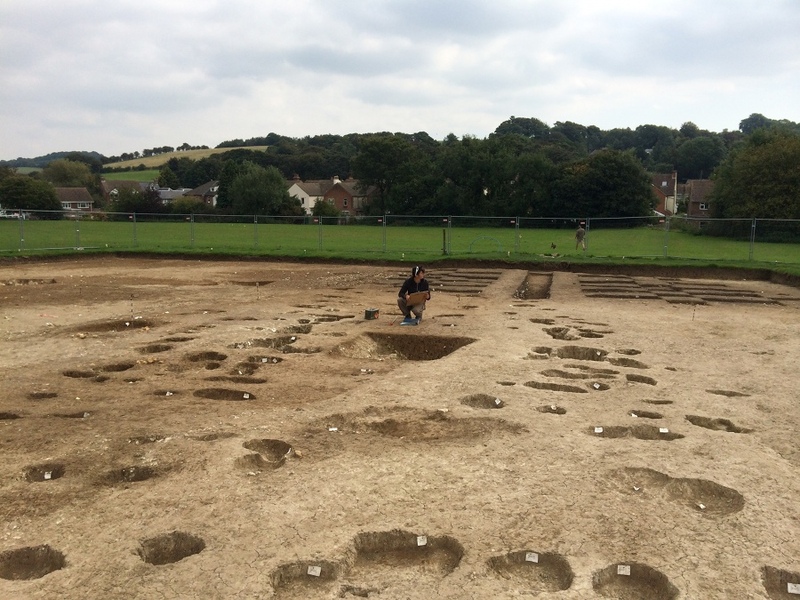 final bonus season of the Lyminge excavations, but we’re thrilled to be able to tide you over until then with the publication of our 2014 Interim Report! It is freely available to download in PDF form here. The report summarises the discoveries of the 2014 excavation, including up-to-date plans of the Tayne Field excavations (produced by Simon Maslin) and the initial interpretations and perspectives on the exciting archaeology that was uncovered, particularly ‘the Blob’, the unusual Anglo-Saxon midden that we are going back to look at from 3rd – 30th August 2015. The cover of the 2014 Interim report, now available to download. All our interim reports since 2008 are available under the ‘Publications’ menu at the top of the webpage, so you can follow our discoveries there too, and indeed you can go directly to our archive in the Integrated Archaeological Database to look at individual site records too. You’ll also find links to the many externally published articles by the team there too. 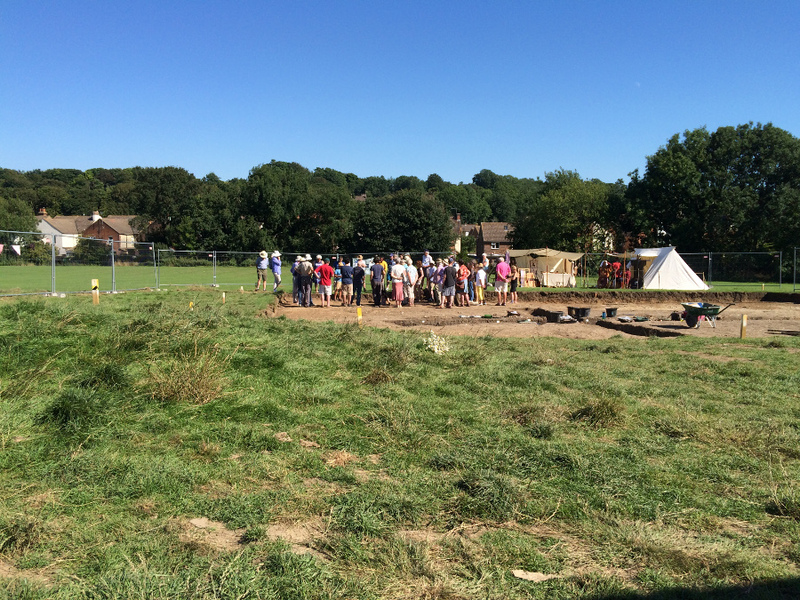 Don’t forget that you’ll be able to volunteer on the dig as usual, or if you aren’t able to volunteer you can visit the site on a Saturday at 2pm for a site tour by our director, Dr Gabor Thomas. 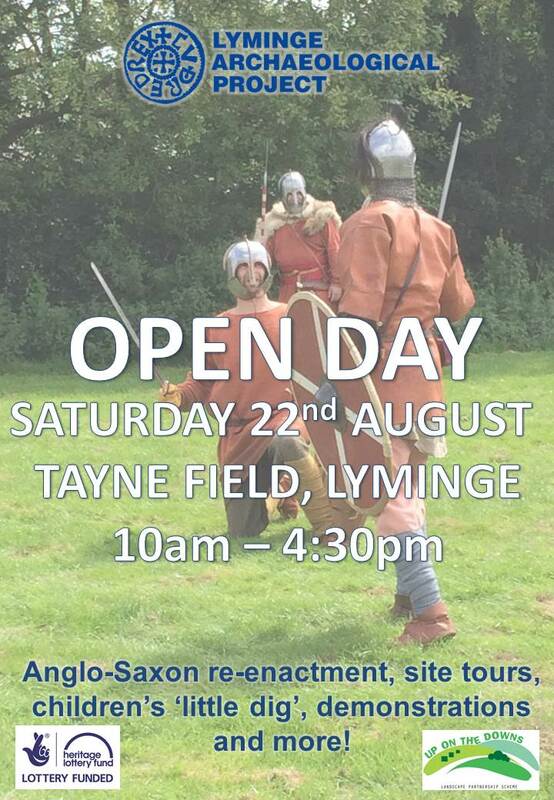 On 22nd August we’ll be holding an open day with activities, site tours and Anglo-Saxon re-enactments. Lots more information about the open day will be coming very soon. We hope to see you there – but if you can’t make it we’ll still be blogging and tweeting from the field as per usual! 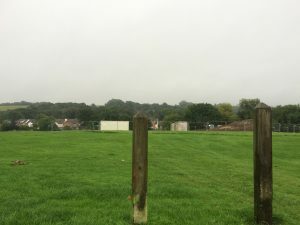 I promised that there would be more than one blog post as I couldn’t fit all the exciting news from Lyminge Project HQ into one blog post! Some of you will already be aware of this news as we have been talking about it, but it’s only now that we’ve had time to put all this into a post to officially announce on the web and social media. Aiji finishes recording in the last days of Lym14, after the dig officially ended. The midden or ‘blob’ is just behind him. After we finished the last AHRC funded excavations on Tayne Field last year, working madly overtime to get everything done, we were left with a conundrum. A week after the official end of the dig when all students, staff, and volunteers had packed up and gone home, our Site Director Gabor Thomas, myself (Alexandra Knox), and staff members Aiji Castle and Emily Harwood remained on site for a week trying to get every last bit of archaeology recorded (not forgetting our finds supervisor Helen Harrington and those finds volunteers who also gave the project masses of overtime!). 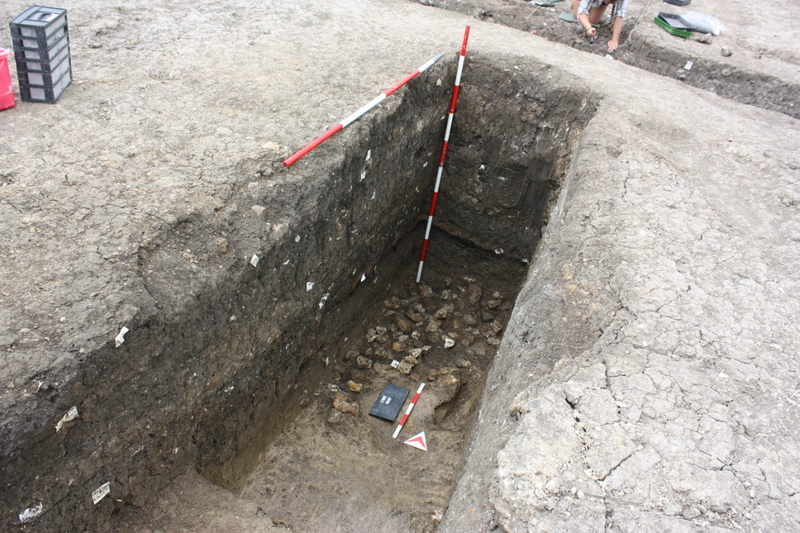 As far as we managed to get with the ‘blob’ – the clay beneath the flint layer still isn’t natural geology and there may be up to another 1m of deposits beneath the flints. We succeeded, but only because we reluctantly came to a halt on the excavation of the ‘blob’, the enormous midden feature in Trench 1. 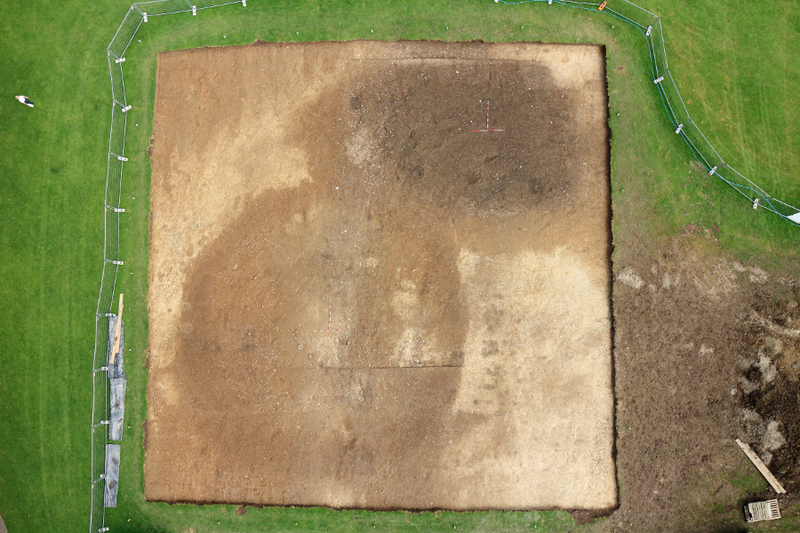 During the six week dig we were able to put a major east-west trench across it, as well as two smaller north-south trenches, and to excavate a 1 x 1 m grid across the entirety of the 8 x 15 m midden area. The central trench got down to almost 2 m deep, and coring proved that there was still a way to go. We placed plastic over the archaeology before backfilling, in the hope that we might be able to come back to finish the job at some point in the future. We shall not be able to fully excavate or even make this central trench deeper, partly due to safety but also because of the sheer quantity of material. We knew, however, that we had to get more answers, particularly to the questions of the origins of this rather peculiar hole in the ground, and its full size and relationship to the Bronze Age ring ditch, all questions necessary to be able to publish our results. We began to think about coming back for a very short dig this summer, but of course even the smallest volunteer focused dig costs. 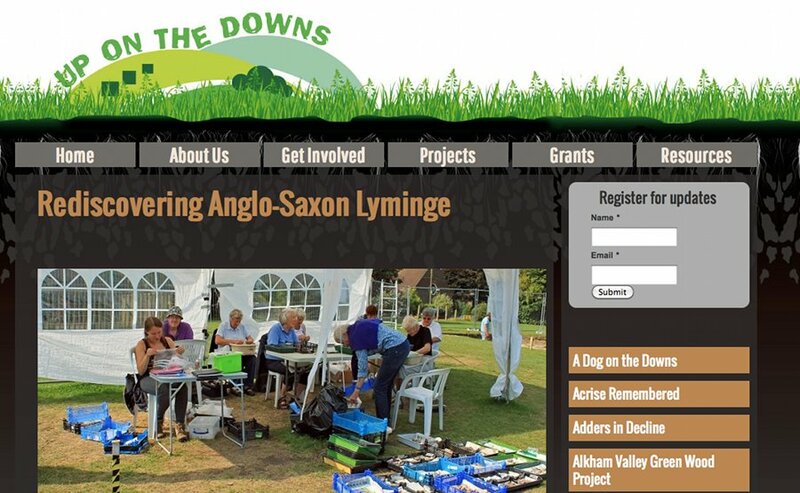 We applied to the Up on the Downs Partnership for a small grant of £10,000 to enable us to do this. We are thrilled to announce that we have been successful in our application to the scheme! Up on the Downs is a £2.5 million Heritage Lottery funded Landscape Partnership Scheme that aims to make a significant difference to the easily recognisable and iconic landscape of the Dover and Folkestone area, particularly by investing in heritage, landscape and wildlife, and most importantly community, and we are so pleased that they have recognised the Lyminge Archaeological Project’s past and future contribution in these areas by awarding us part of their funding. You can see the other types of projects that they have been able to fund here. Their website has a nice summary of the work they’re funding with us too! Combined with a generous private donation received at the end of the last dig, we are now fully equipped to be able to get our ‘final answers’ from Tayne Field. 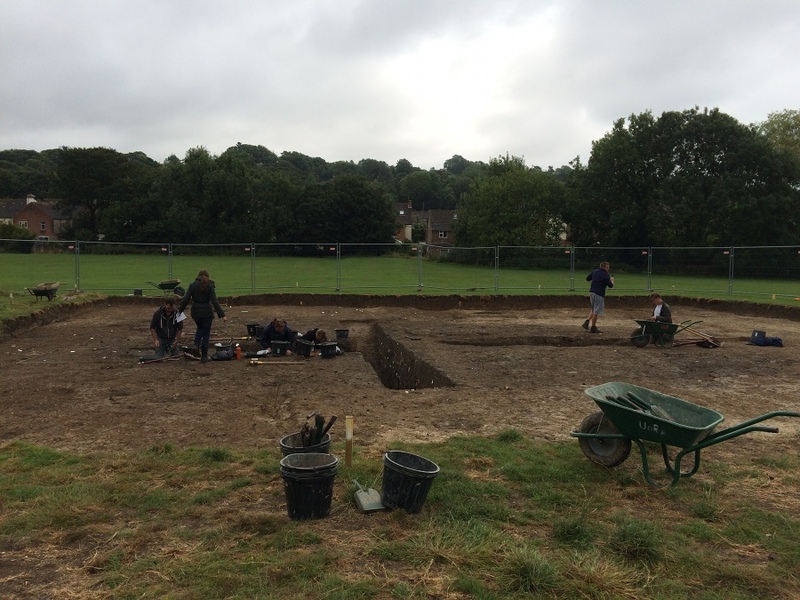 This summer, from 3rd – 29th August 2015, we will be running a four week excavation to tie up these loose ends from the ‘blob’, and we will be, as per usual, accepting volunteers. The dig will not be on the same scale as those from the past three years, with a much smaller core team, a shorter dig season and targeted trenches rather than large open area excavations, but all this should be plenty to help us answer those remaining research questions! 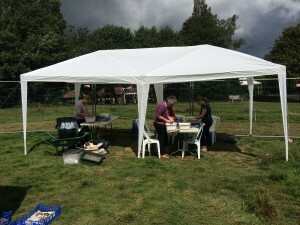 Depending on the archaeology we may need to cap digging volunteer numbers per day, but we will absolutely be taking volunteers, particularly for finds washing and processing. More details about how to sign up to volunteer will go up soon, and if you have volunteered before, we’d love to have you back! Don’t forget that this season will be absolutely the last excavations that we’ll be undertaking on Tayne Field, as our plans for the future of the project (grant dependent of course) involve post-excavation work and analysis, publication and a whole range of exciting outreach work. If you want to volunteer or visit the site this will be your last chance! We’ll also be having our usual Saturday site tours and perhaps even an Open Day, so watch this space for details – planning is in full swing so it won’t be long! 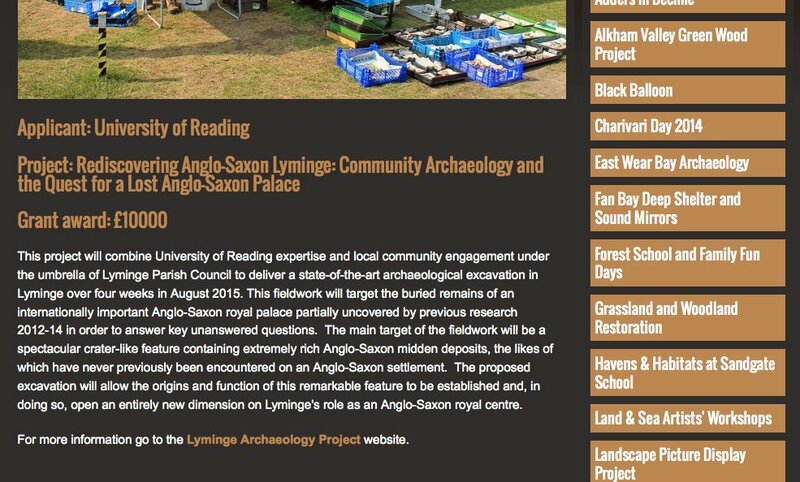 You can subscribe to the blog, or follow us on Facebook and Twitter (@Lymingedig) for real-time updates. Thrilled to have received a HLF grant via Up on the Downs!